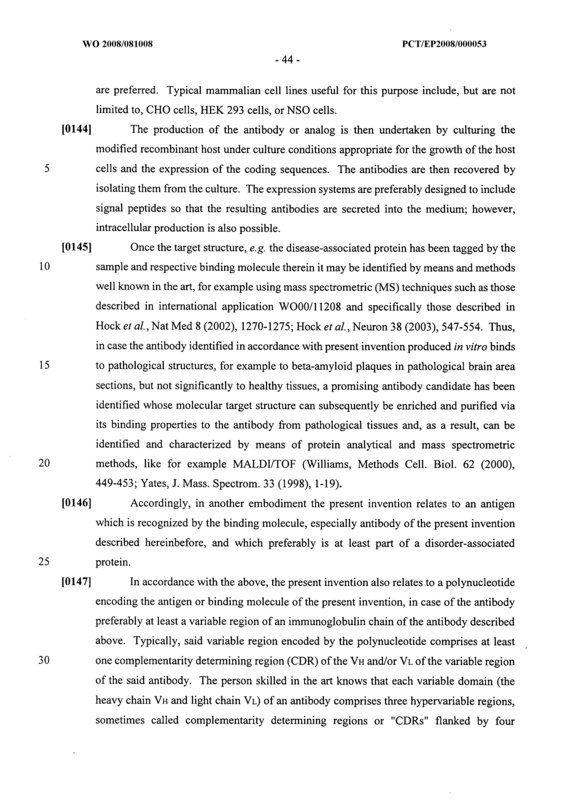 Provided are novel specific binding molecules, particularly human antibodies as well as fragments, derivatives and variants thereof that recognize neoepitopes of disease-associated proteins which derive from native endogenous proteins but are prevalent in the body of a patient in a variant form and/or out of their normal physiological context. 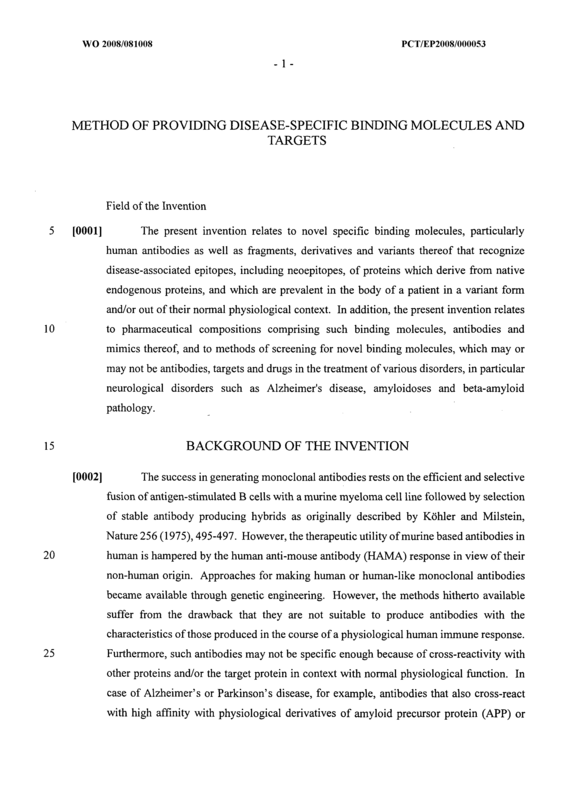 In addition, pharmaceutical compositions comprising such binding molecules, antibodies and mimics thereof and methods of screening for novel binding molecules, which may or may not be antibodies as well as targets in the treatment of neurological disorders such as Alzheimer's disease are described. 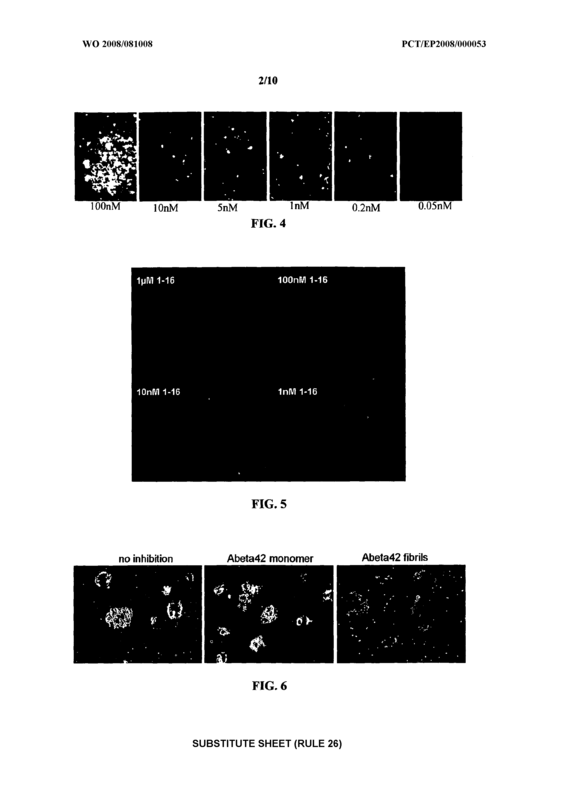 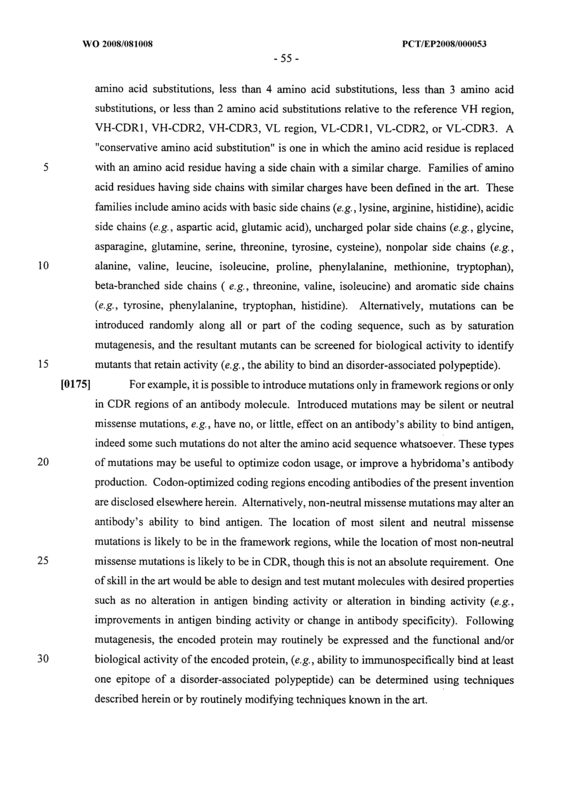 (b) identifying and optionally isolating a binding molecule which binds to said specimen but not to corresponding cells or tissues of a healthy subject. 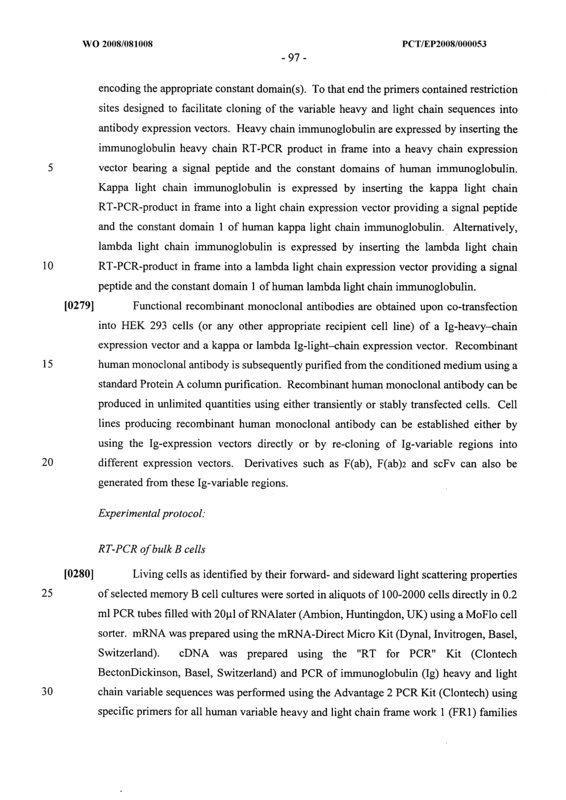 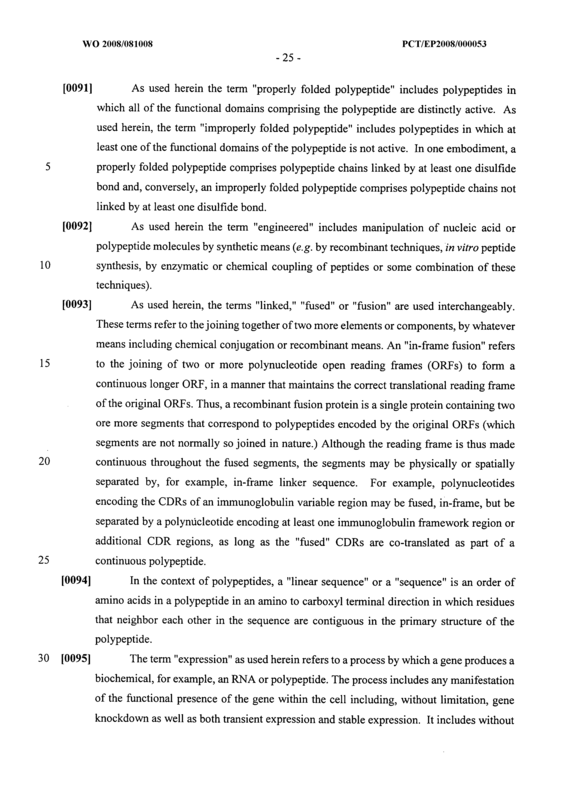 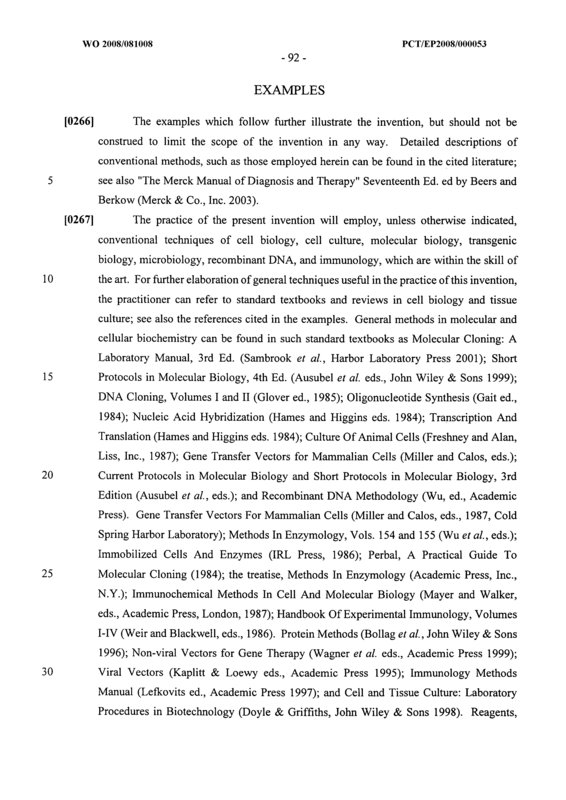 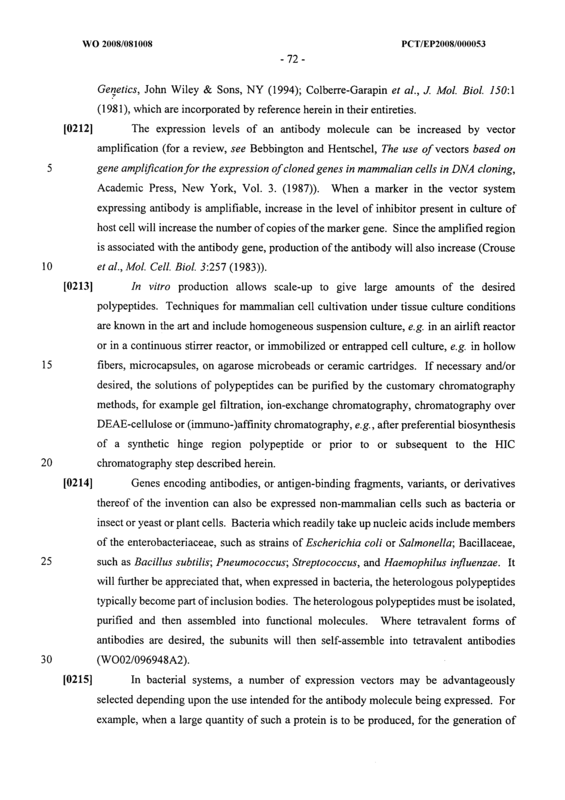 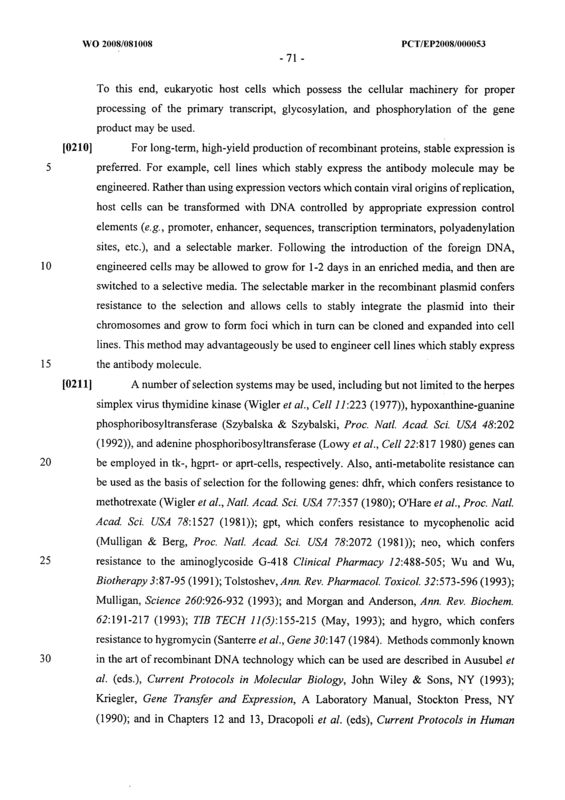 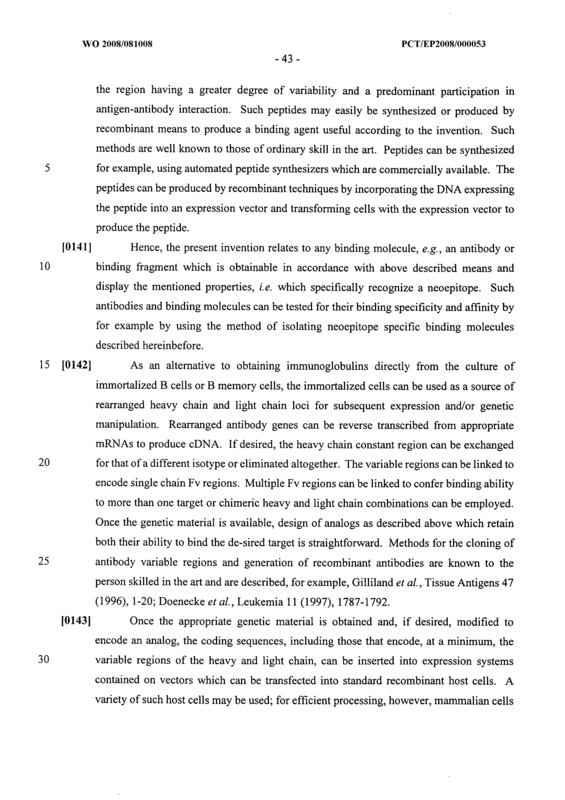 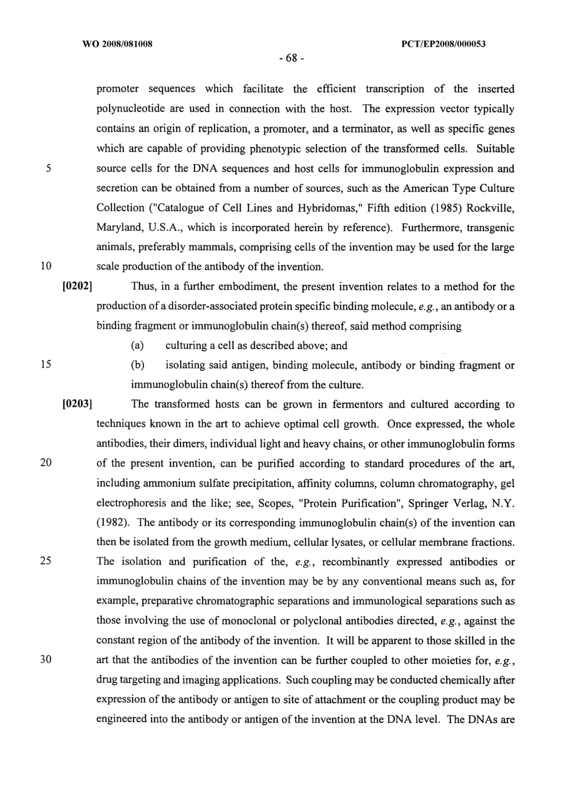 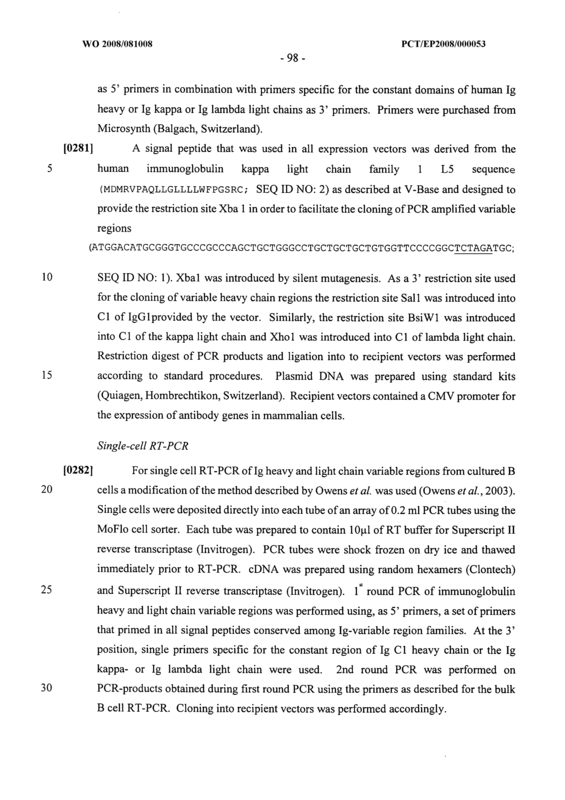 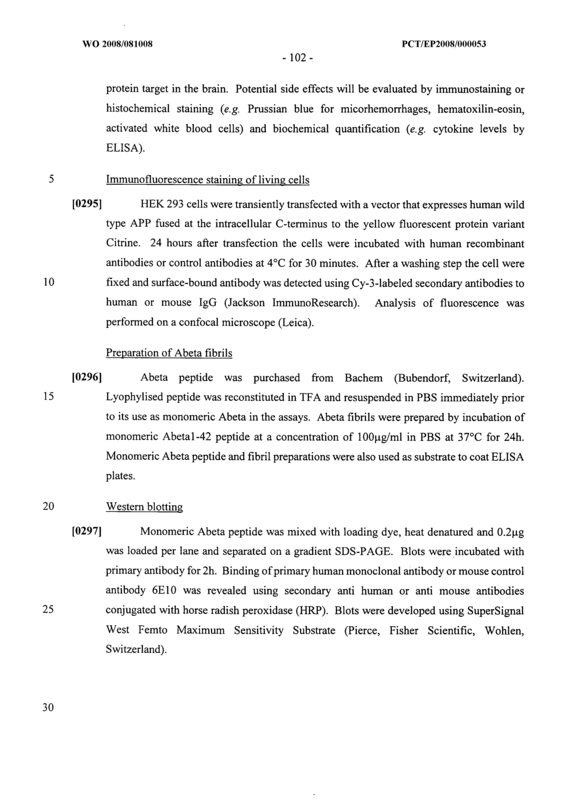 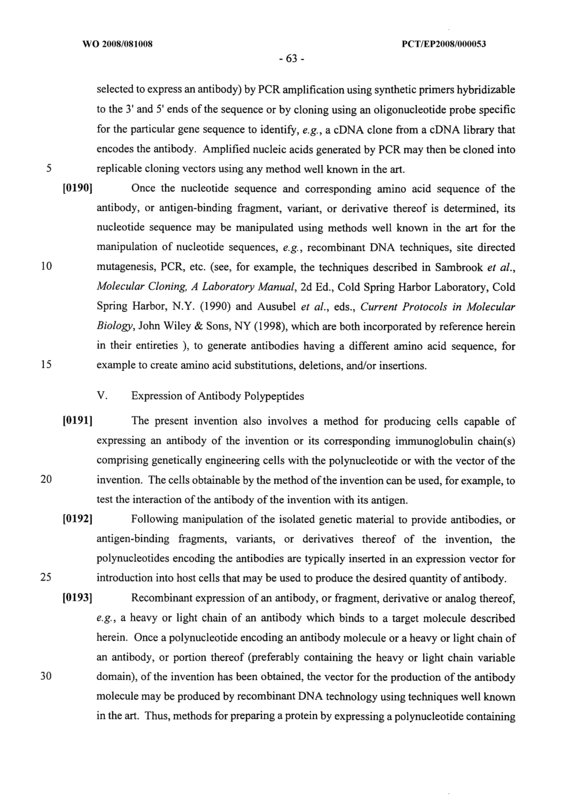 The method of claim 1, wherein said sample comprises a body fluid or a cell sample. 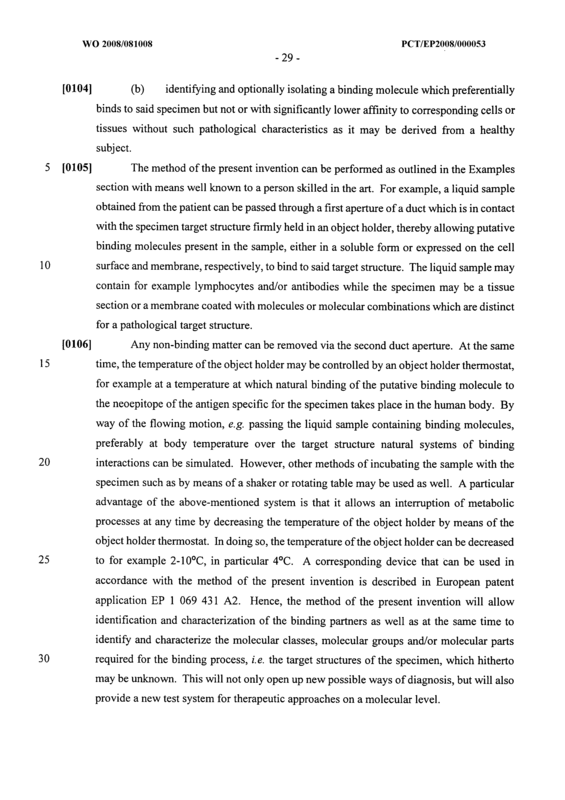 The method of claim 2, wherein said body fluid is a cerebrospinal fluid, plasma or 5 urine. 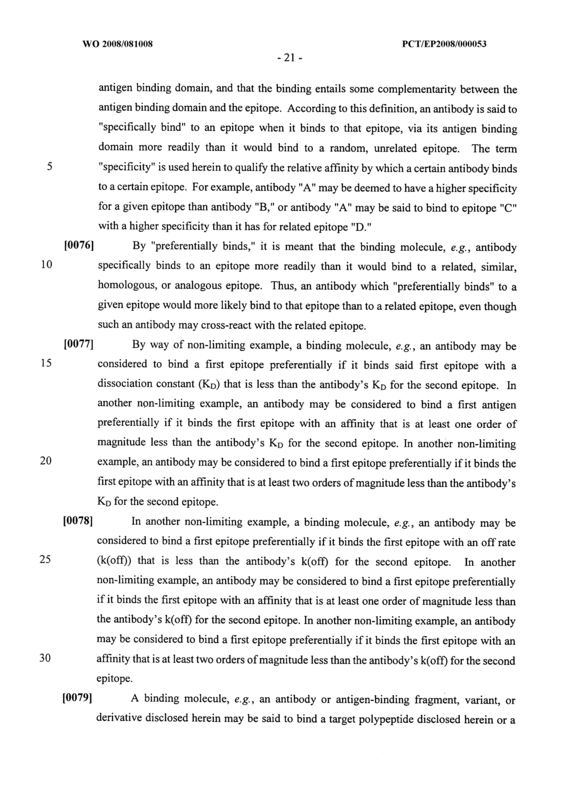 The method of any one of claims 1 to 3, wherein said binding molecule is an antibody. 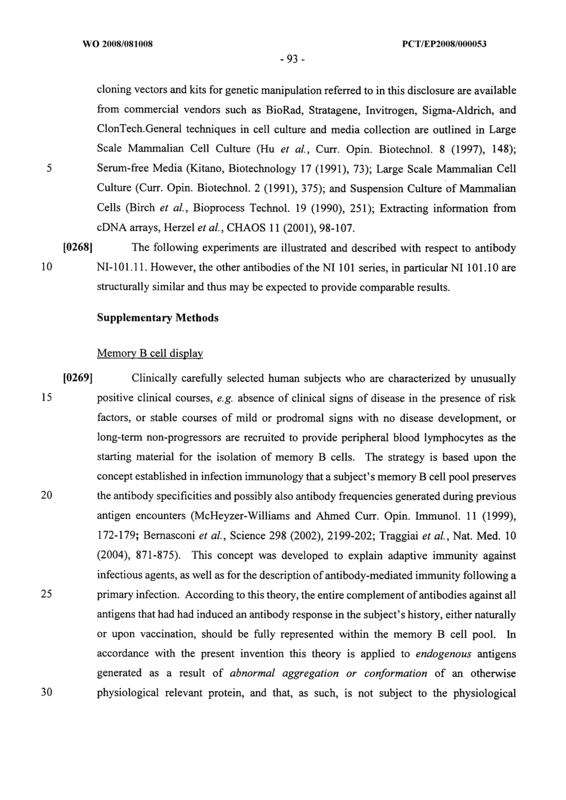 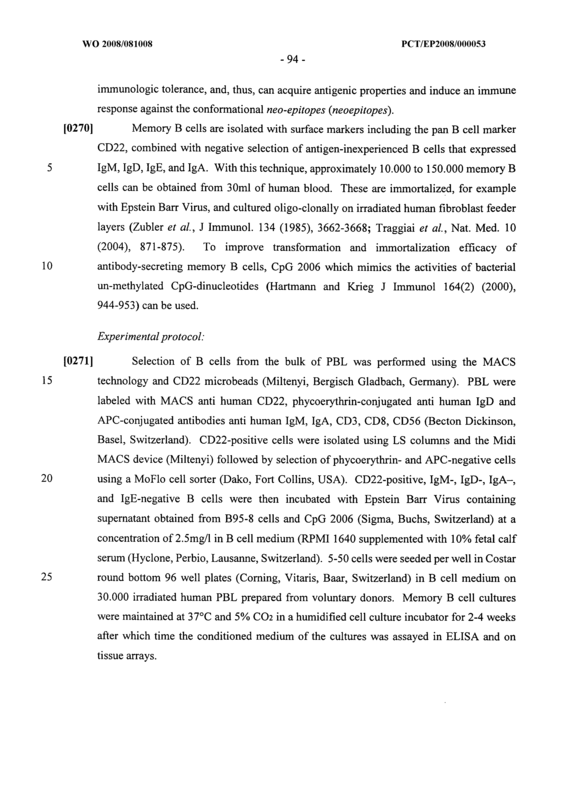 The method of any one of claims 1 to 4, wherein said sample comprises or is derived from B-cells or memory B-cells. 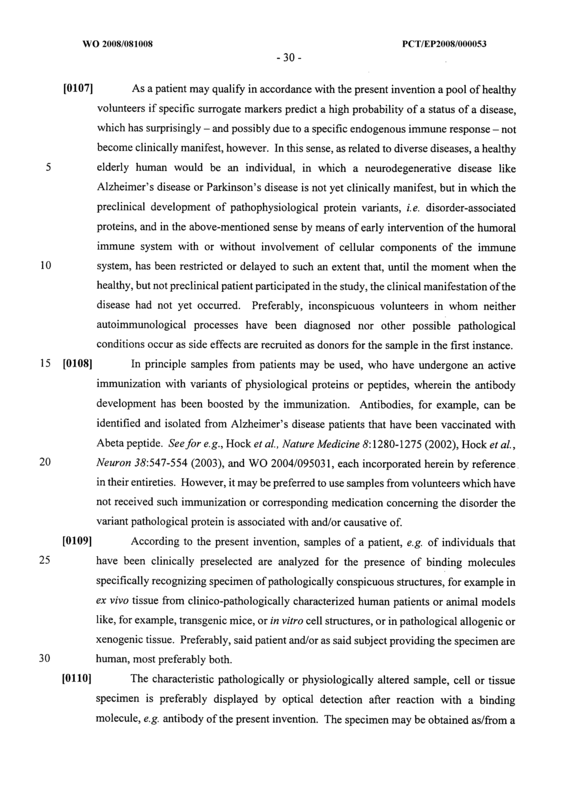 The method of any one of claims 1 to 5, wherein said patient and subject, respectively, is a human. 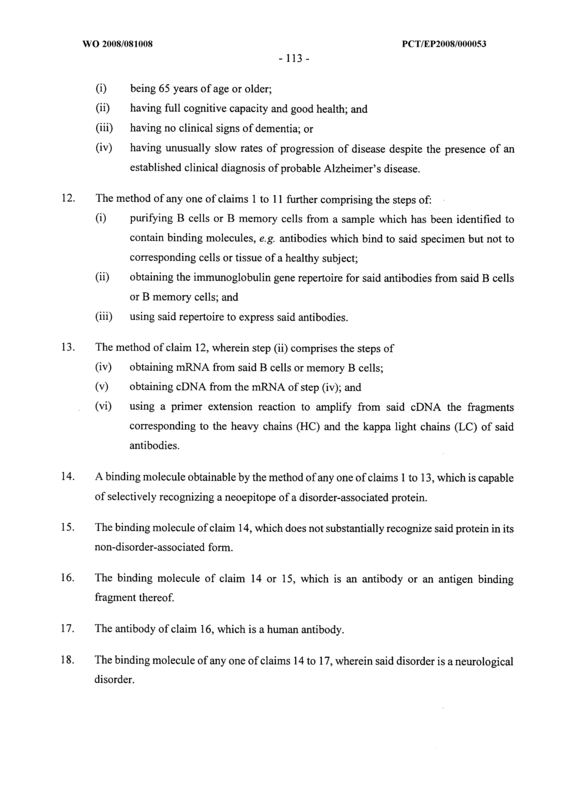 The method of any one of claims 1 to 6, wherein said patient has been determined to be affected with a not yet manifested disorder or at risk to develop the disorder by the presence or absence of a surrogate marker. 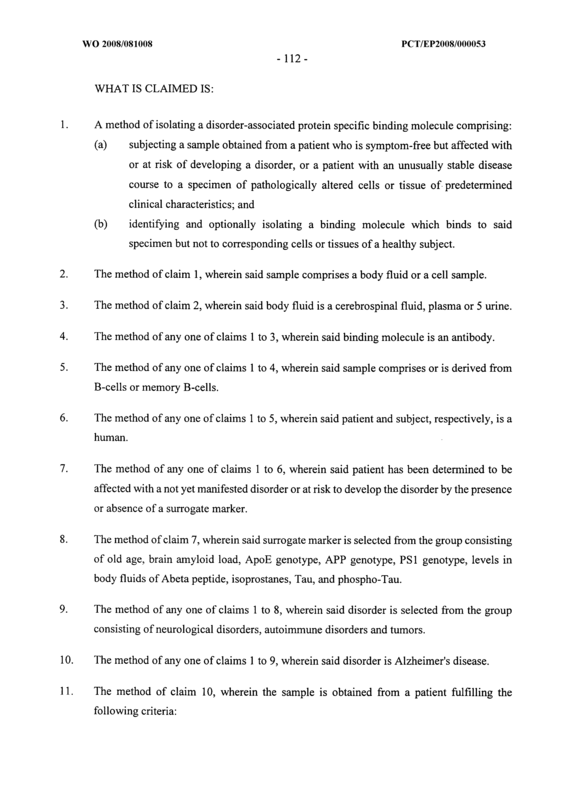 The method of claim 7, wherein said surrogate marker is selected from the group consisting of old age, brain amyloid load, ApoE genotype, APP genotype, PSl genotype, levels in body fluids of Abeta peptide, isoprostanes, Tau, and phospho-Tau. 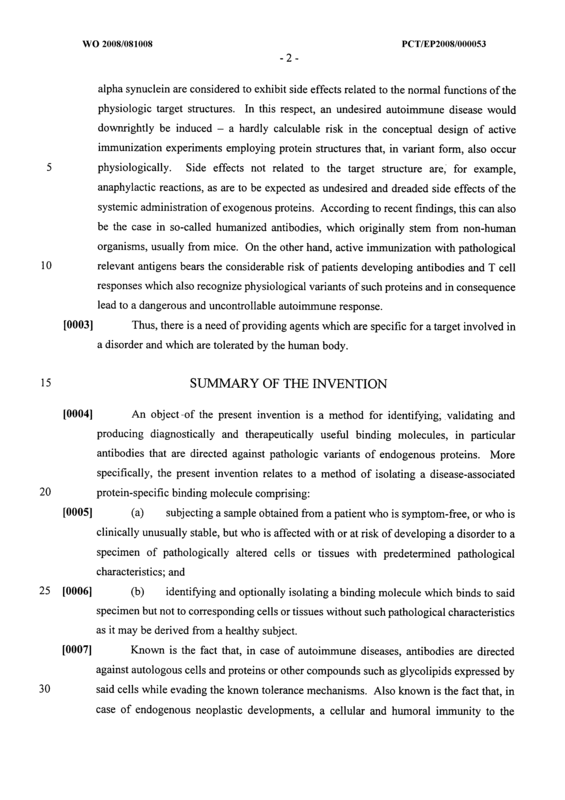 The method of any one of claims 1 to 8, wherein said disorder is selected from the group consisting of neurological disorders, autoimmune disorders and tumors. 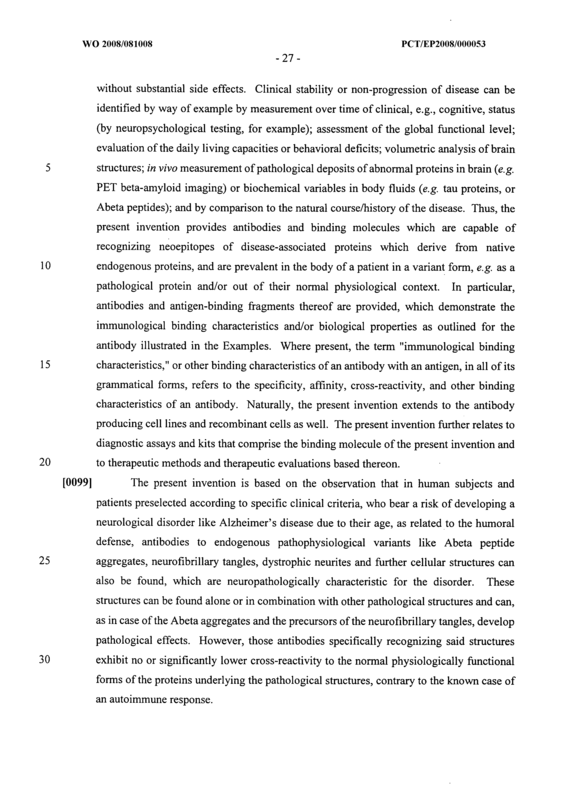 The method of any one of claims 1 to 9, wherein said disorder is Alzheimer's disease. 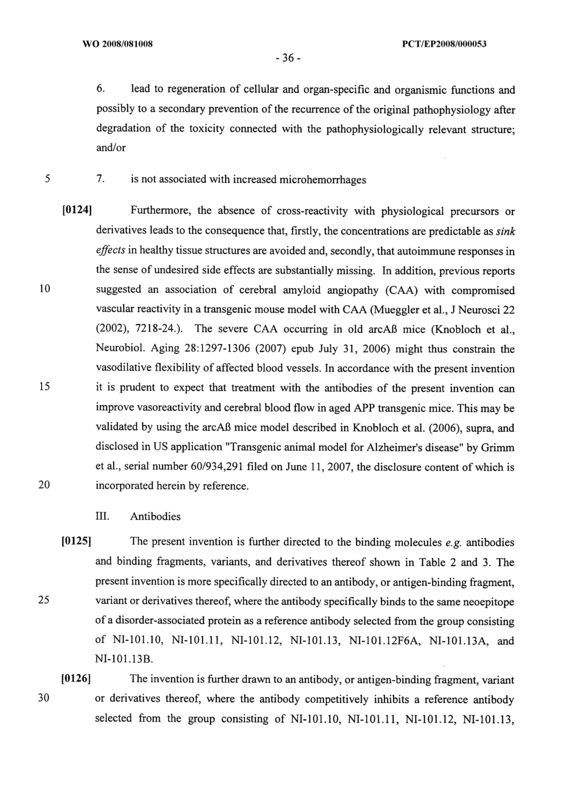 (iv) having unusually slow rates of progression of disease despite the presence of an established clinical diagnosis of probable Alzheimer's disease. 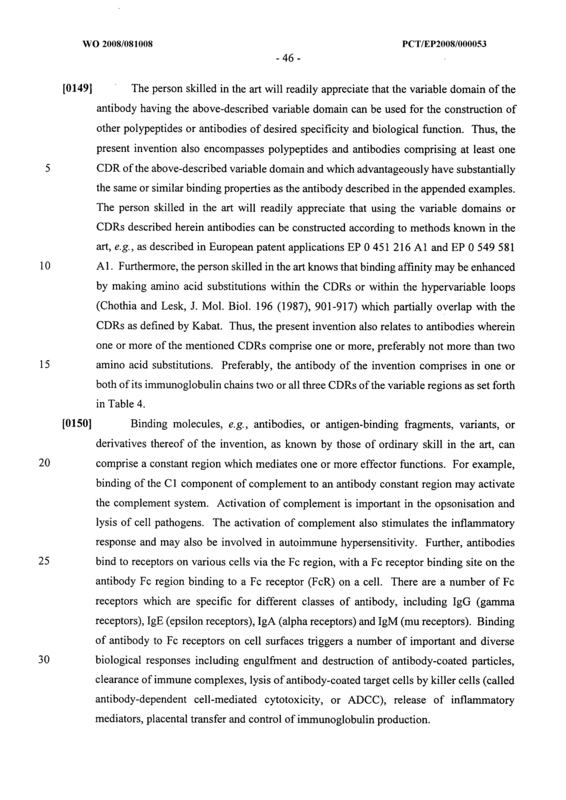 (iii) using said repertoire to express said antibodies. 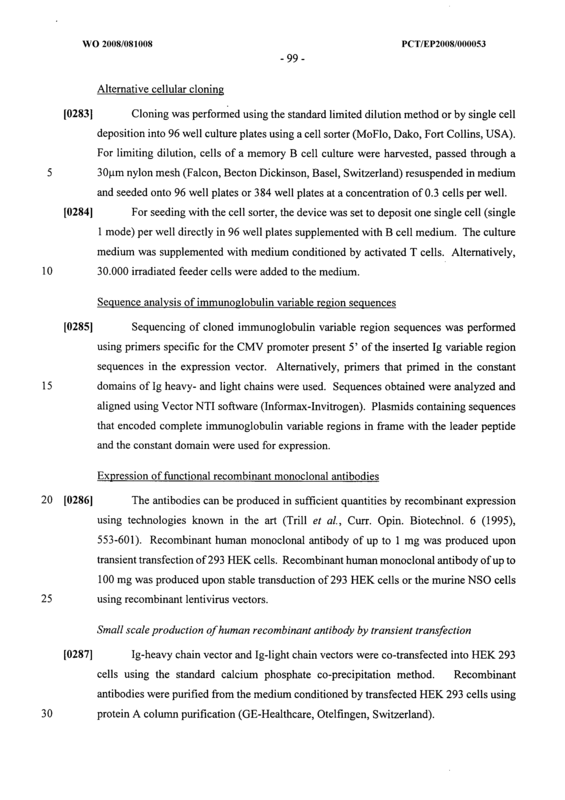 (vi) using a primer extension reaction to amplify from said cDNA the fragments corresponding to the heavy chains (HC) and the kappa light chains (LC) of said antibodies. 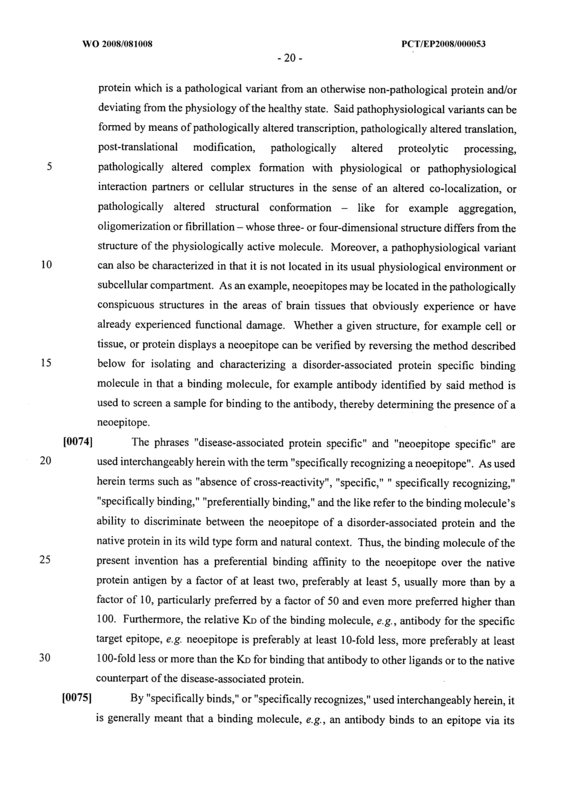 A binding molecule obtainable by the method of any one of claims 1 to 13, which is capable of selectively recognizing a neoepitope of a disorder-associated protein. 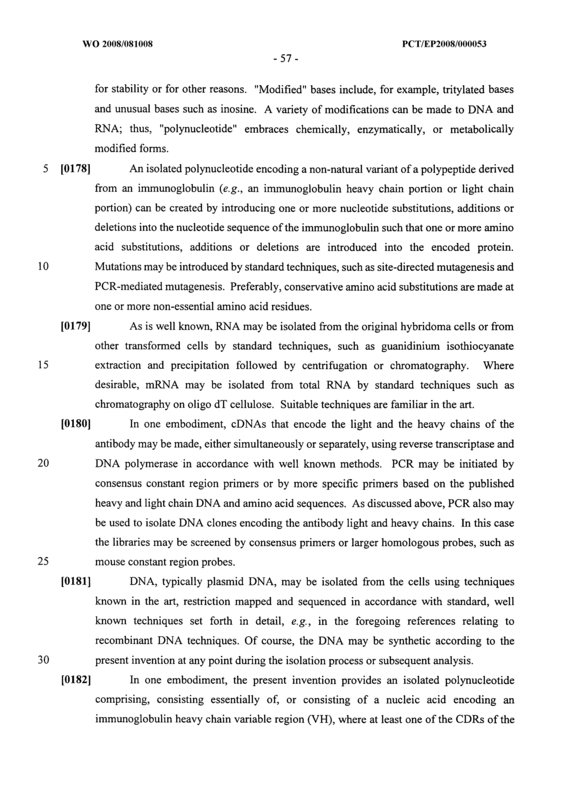 The binding molecule of claim 14, which does not substantially recognize said protein in its non-disorder-associated form. 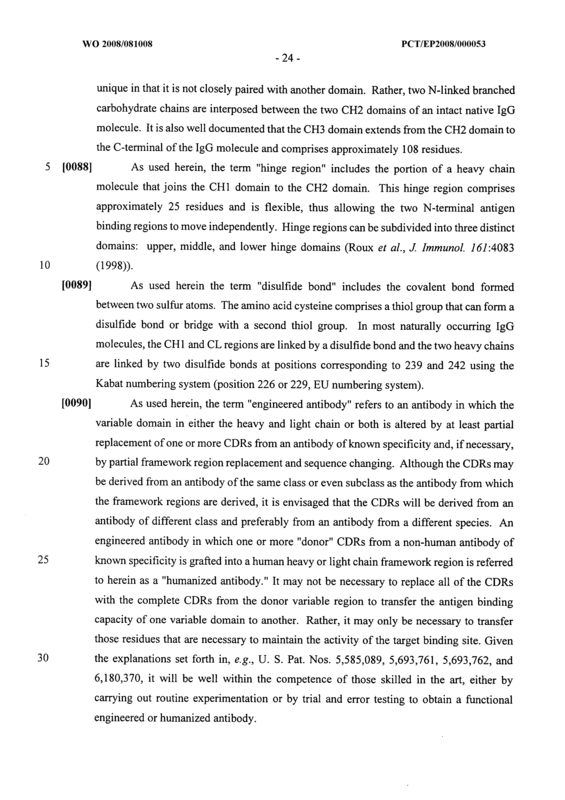 The binding molecule of claim 14 or 15, which is an antibody or an antigen binding fragment thereof. 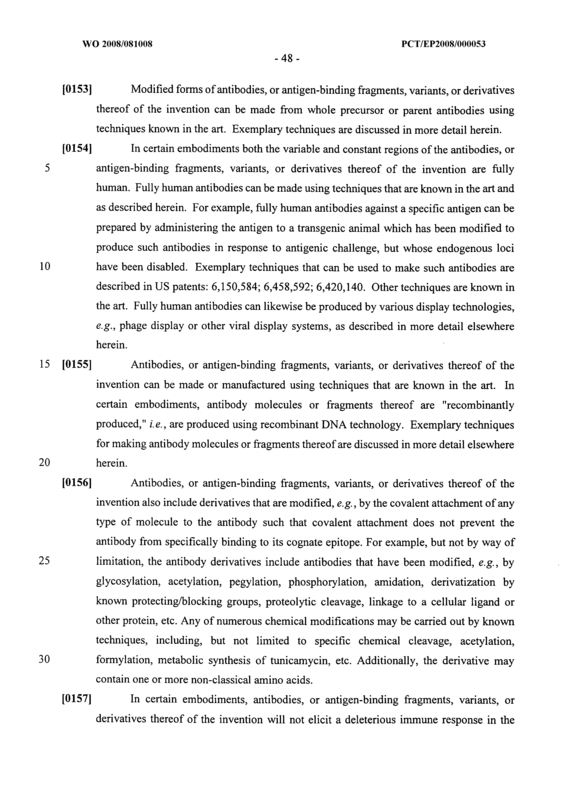 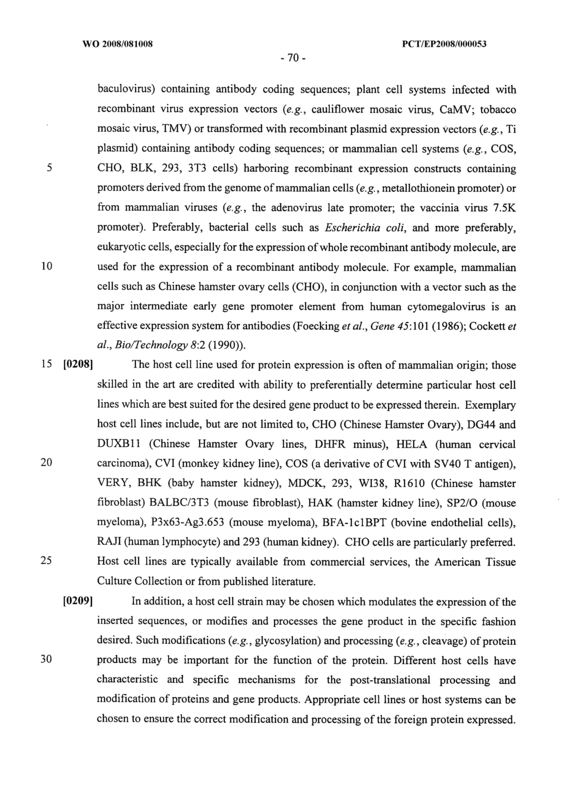 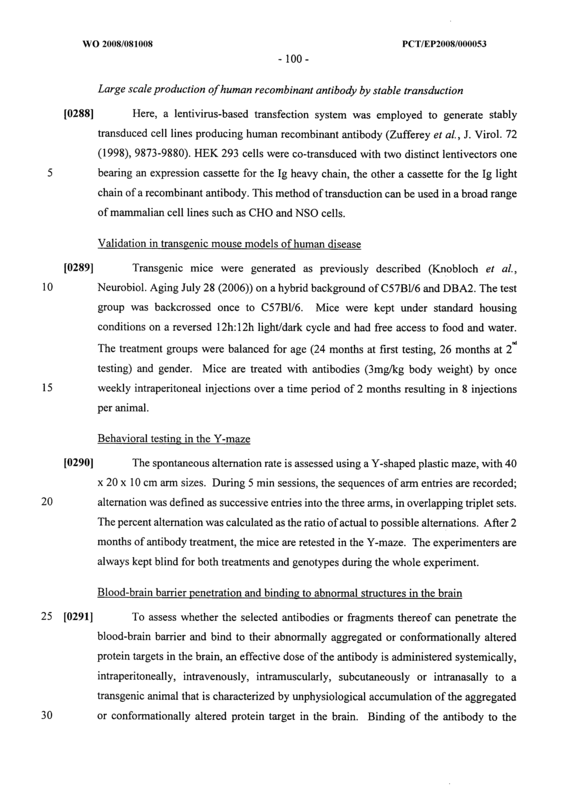 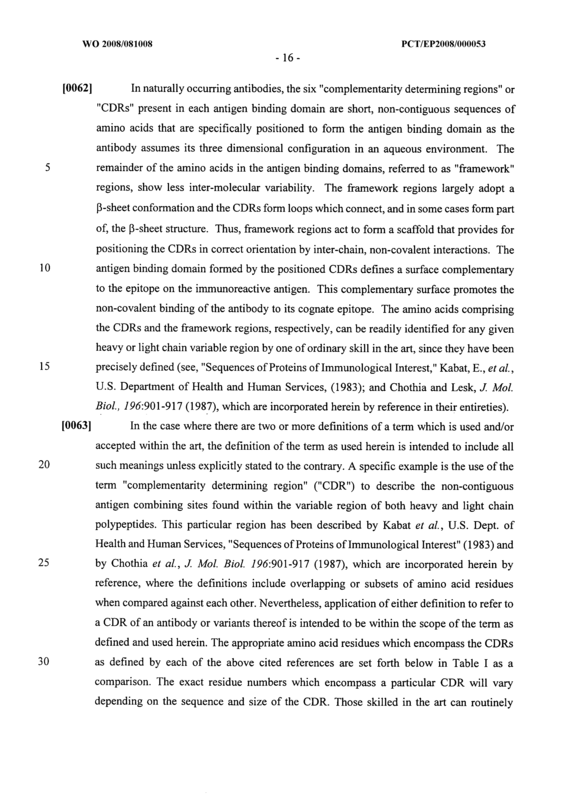 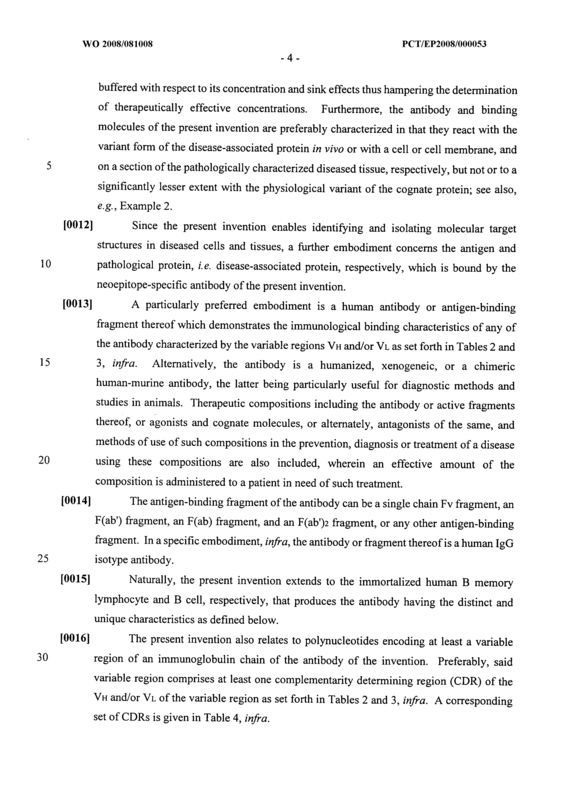 The antibody of claim 16, which is a human antibody. 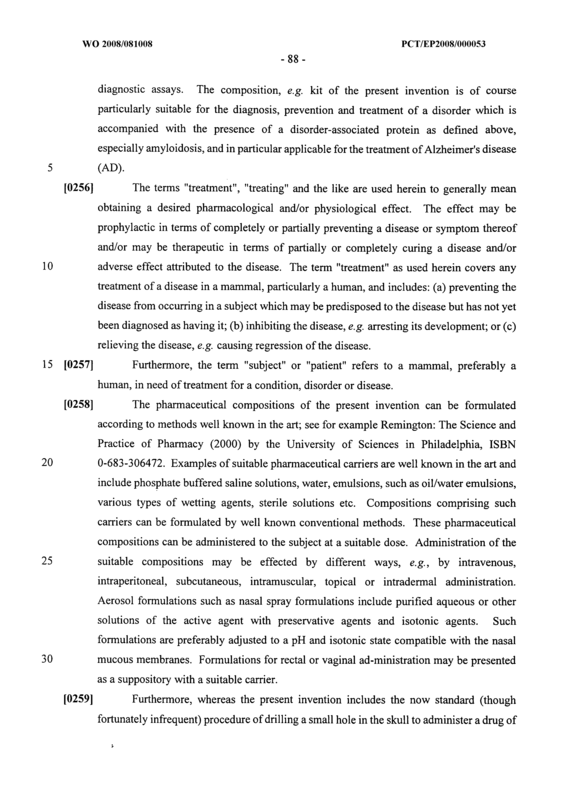 The binding molecule of any one of claims 14 to 17, wherein said disorder is a neurological disorder. 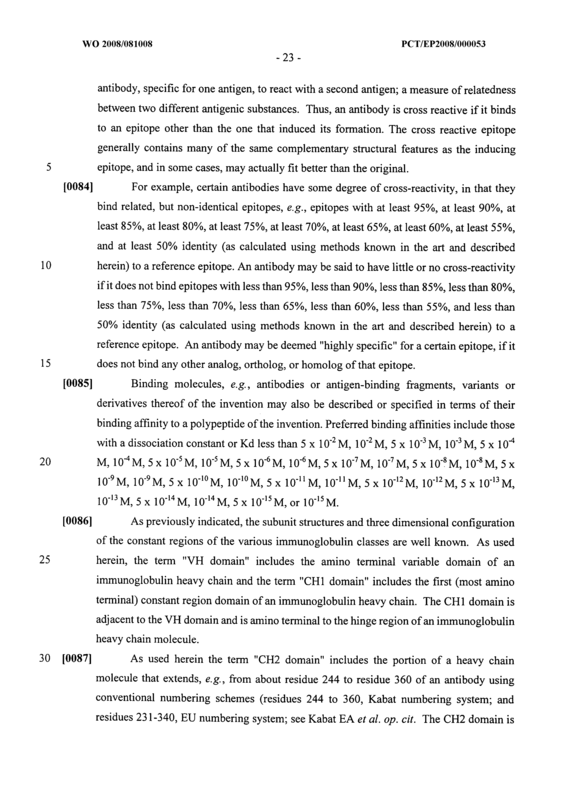 The binding molecule of any one of claims 14 to 18, wherein said disorder is a disorder of the brain. 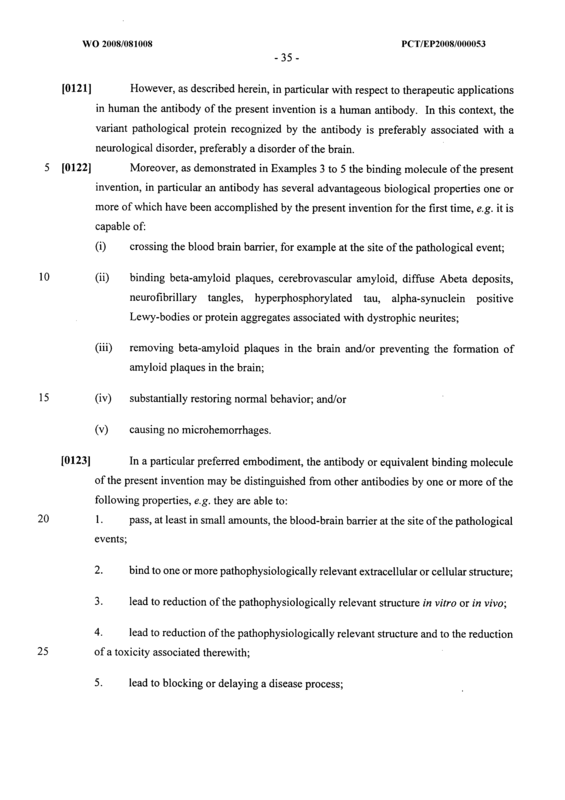 The binding molecule of any one of claims 14 to 19, which is capable of crossing the blood brain barrier at the site of the pathological event. 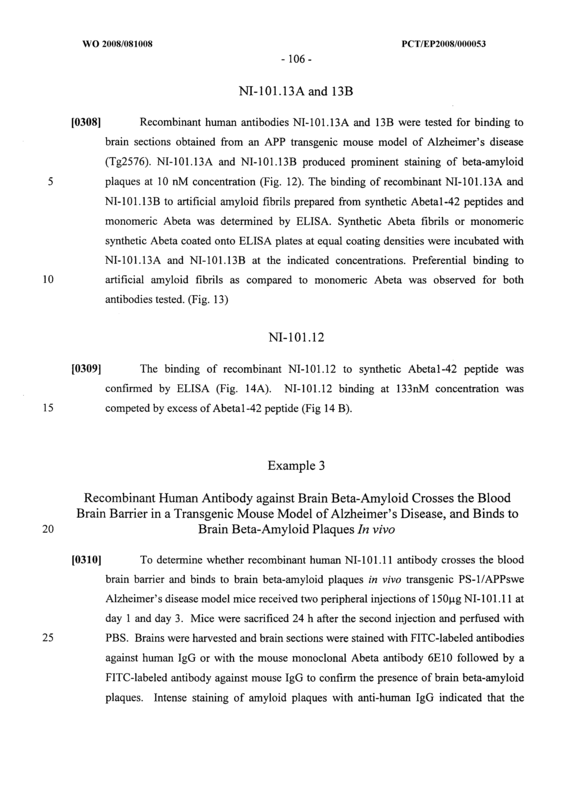 The binding molecule of any one of claims 14 to 20, capable of binding beta-amyloid plaques, cerebrovascular amyloid, diffuse Abeta deposits, neurofibrillary tangles, hyperphosphorylated tau, alpha-synuclein positive Lewy-bodies or protein aggregates associated with dystrophic neurites. 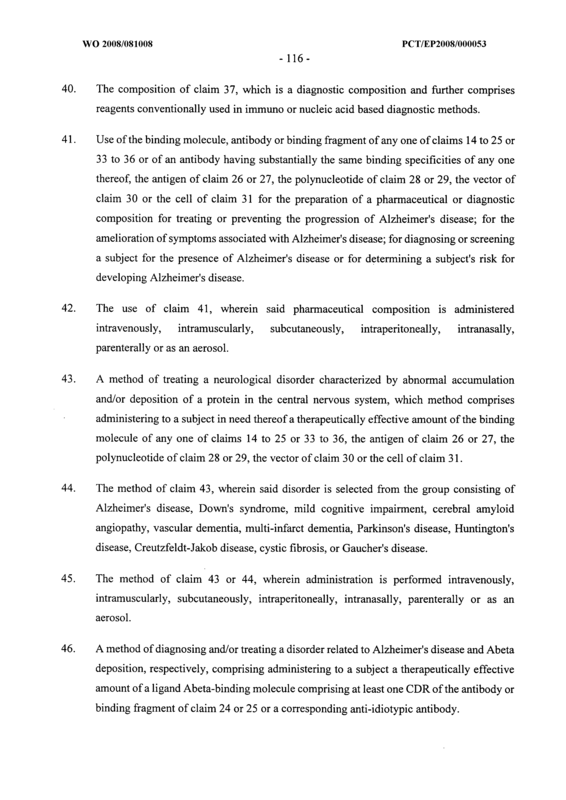 The binding molecule of any of claims 14 to 21, which is capable of substantially restoring normal behavior. 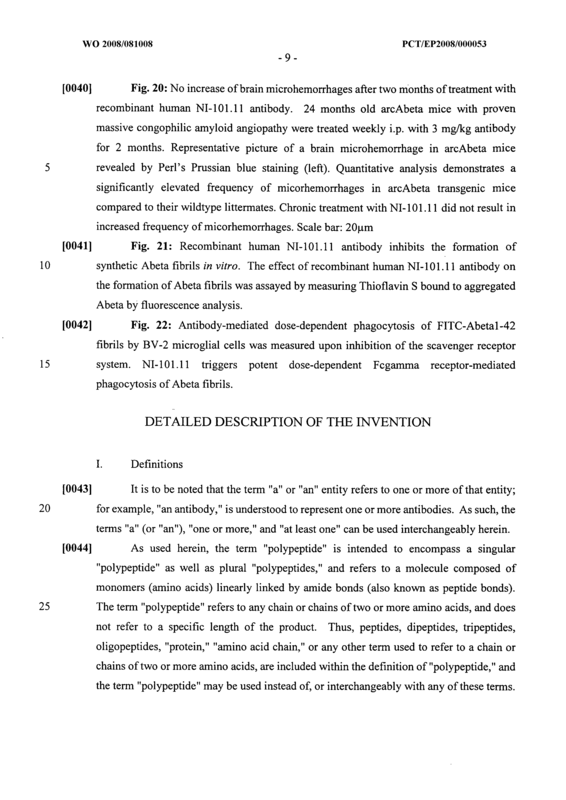 The binding molecule of any one claims 14 to 22, which is selected from the group consisting of a single chain Fv fragment (scFv), a F(ab') fragment, a F(ab) fragment, and an F(ab')2 fragment. 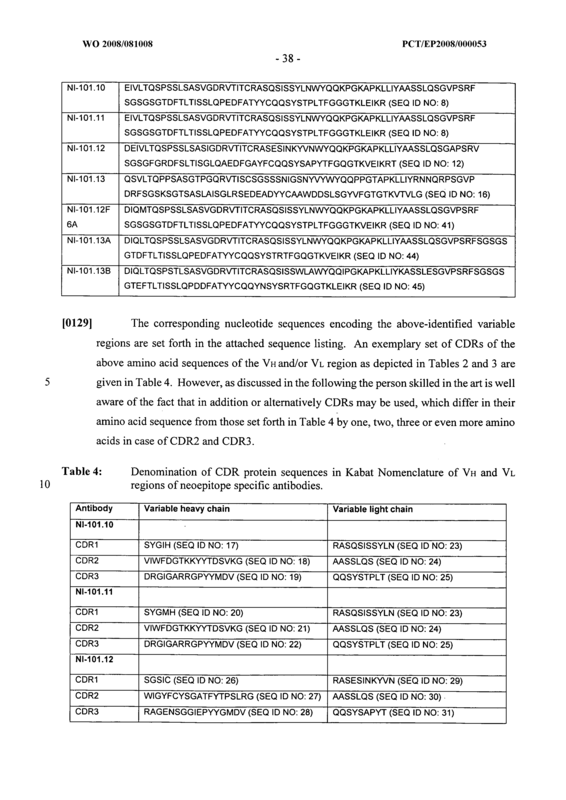 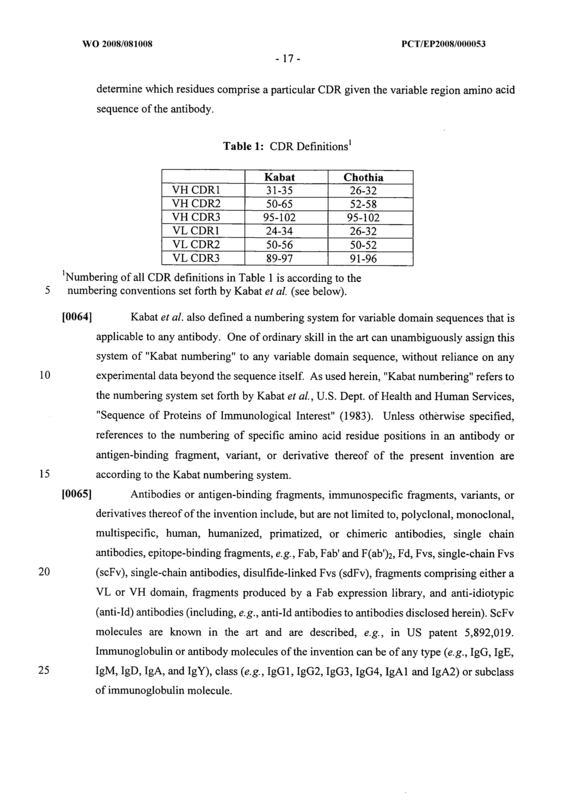 The binding molecule of any one claims 14 to 23 , which is an antibody or binding fragment thereof comprising in its variable region at least one complementarity determining region (CDR) as depicted in Table 4. 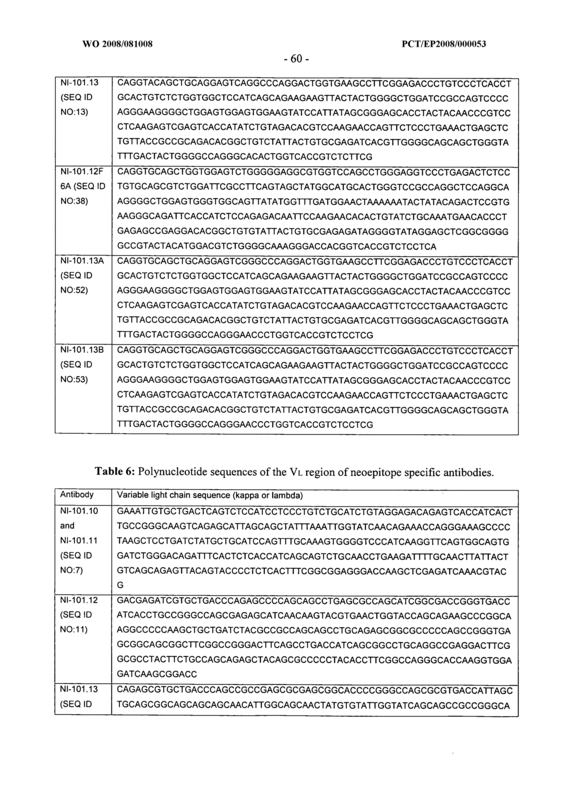 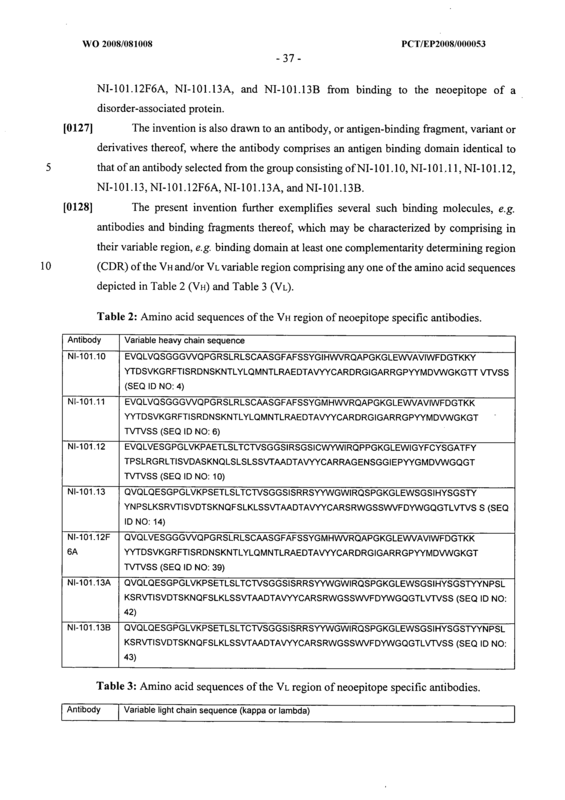 The antibody or binding fragment of claim 24 comprising an amino acid sequence of the VH and/or VL region as depicted in Tables 2 and 3. 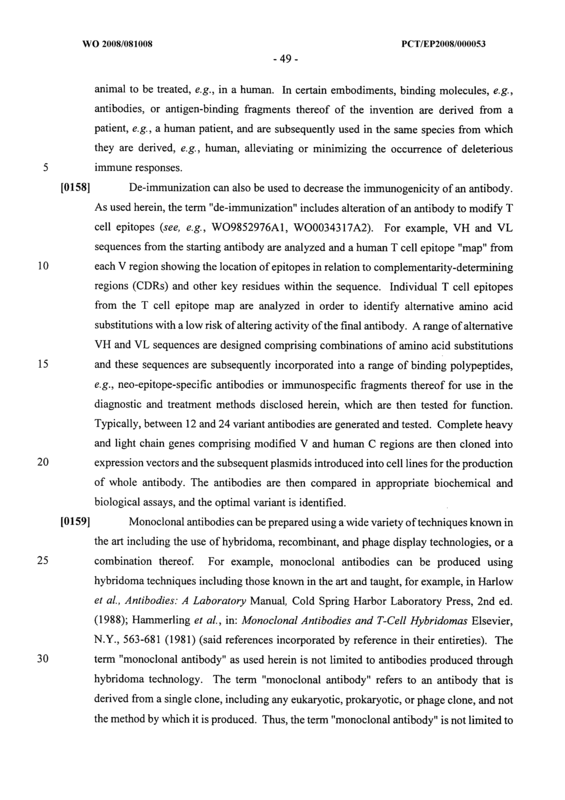 An antigen which is recognized by the binding molecule of any one of claims 14 to 25. 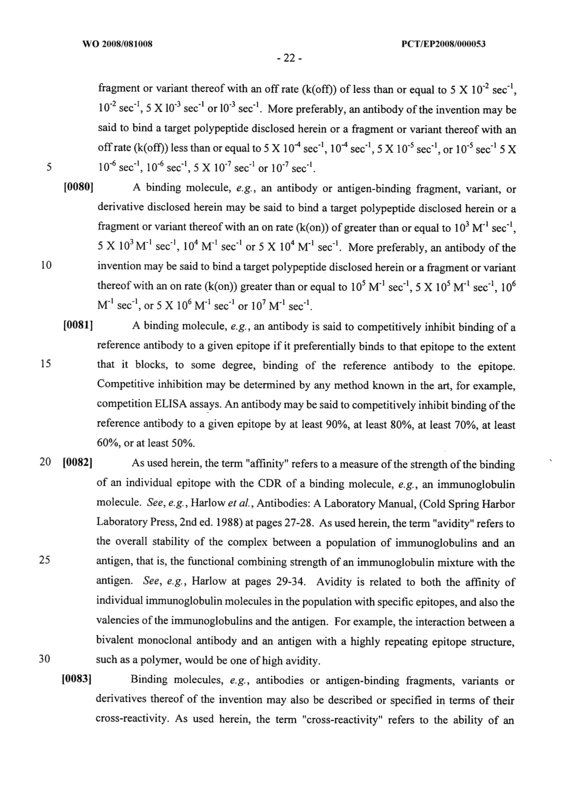 The antigen of claim 26, which is at least part of a disorder-associated protein as defined in any one of the preceding claims. 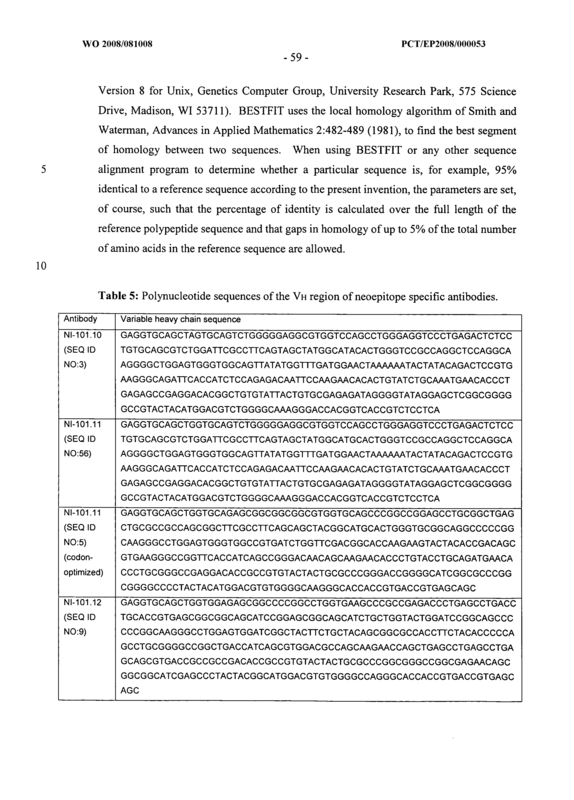 A polynucleotide encoding the binding molecule of any one of claims 14 to 25 or the antigen of claim 26 or 27. 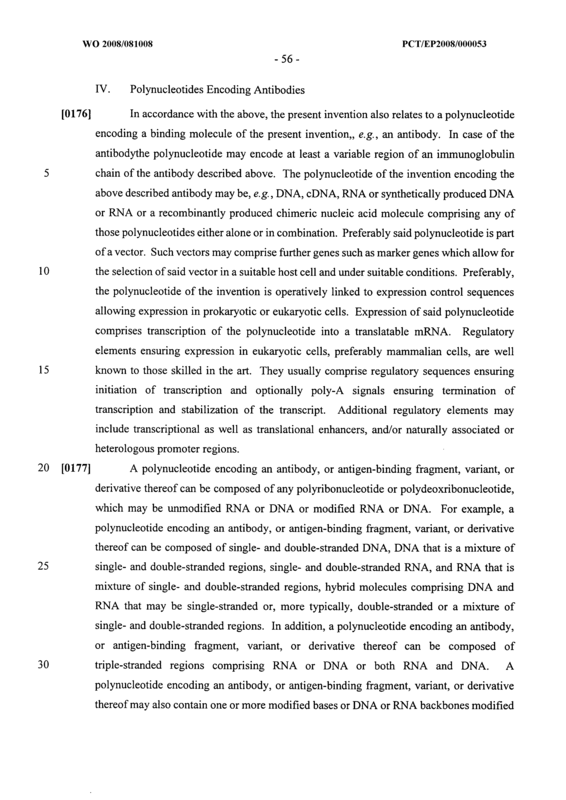 The polynucleotide of claim 28 encoding at least the variable region of an immunoglobulin chain of the antibody or binding fragment of claim 24 or 25. 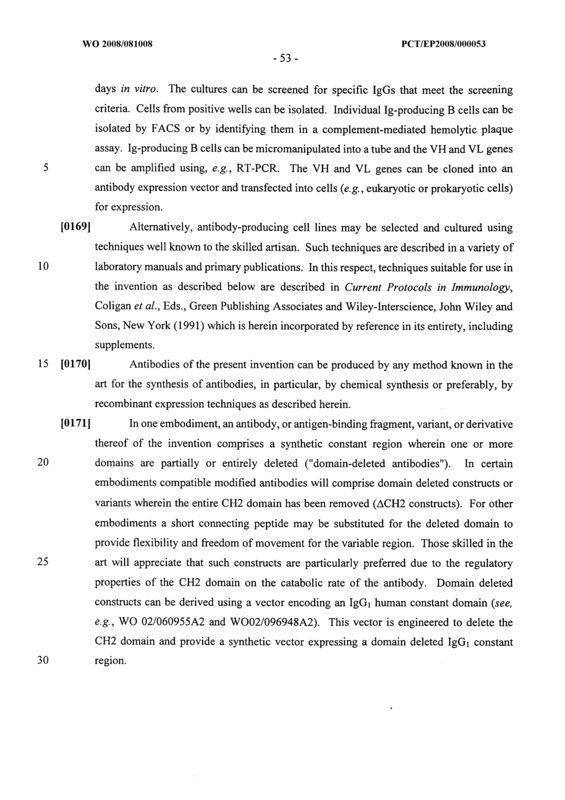 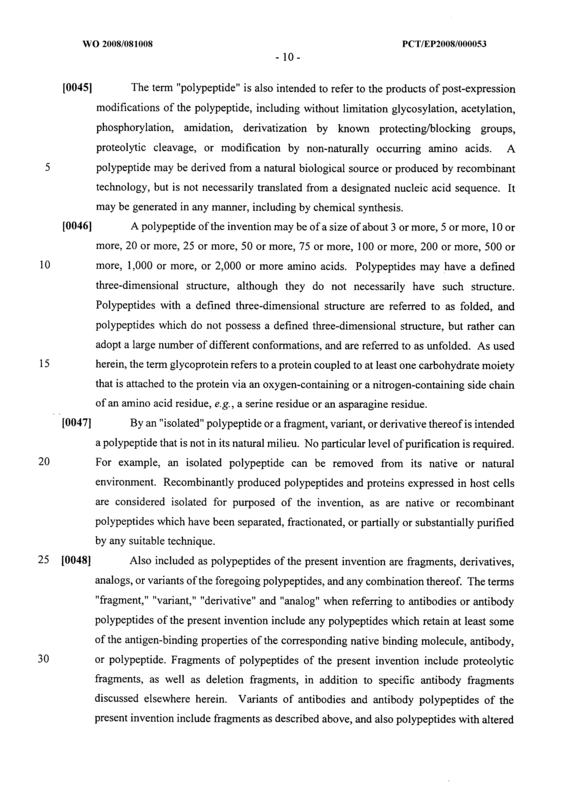 A vector comprising the polynucleotide of claim 28 or the polynucleotide of claim 29, optionally in combination with a polynucleotide of claim 29 that encodes the variable region of the other immunoglobulin chain of said antibody. 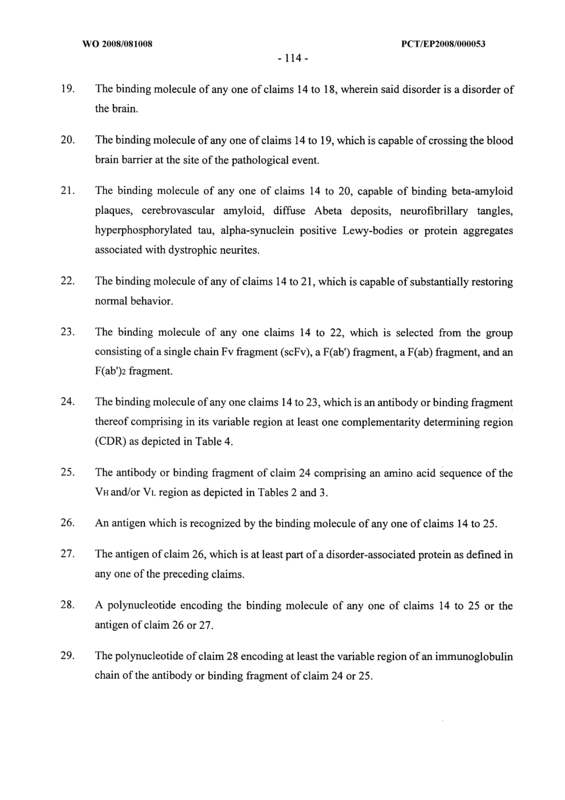 A host cell comprising a polynucleotide of claim 28 or 29 or a vector of claim 30. 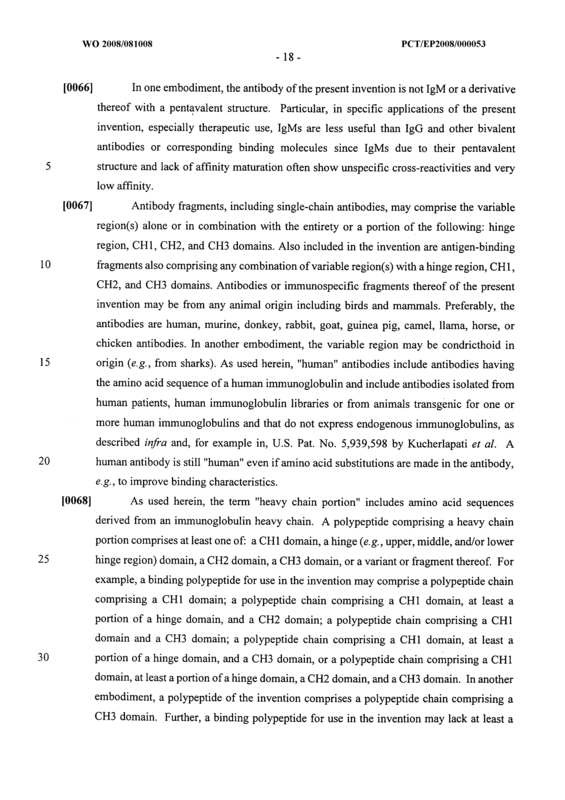 (b) isolating said binding molecule, antibody or binding fragment or immunoglobulin chain(s) thereof from the culture. 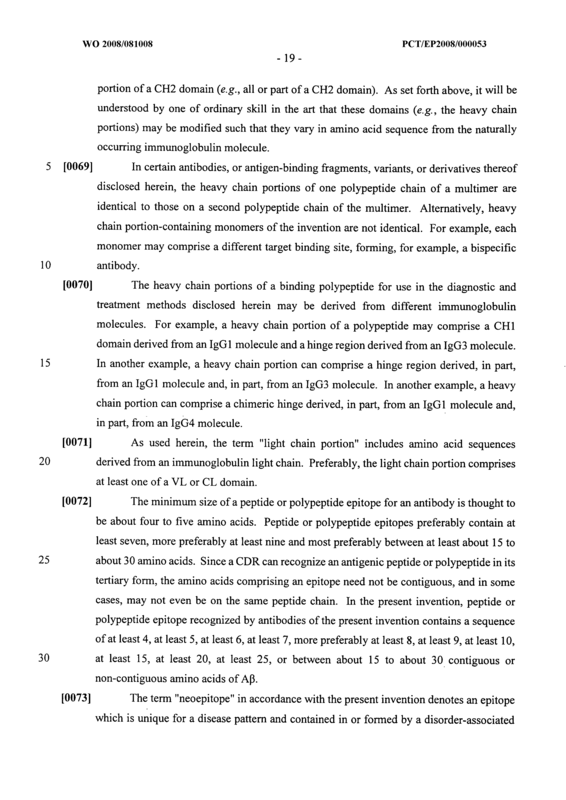 A binding molecule, an antibody, an immunoglobulin chain or a binding fragment thereof encoded by a polynucleotide of claim 28 or 29 or obtainable by the method of claim 32. 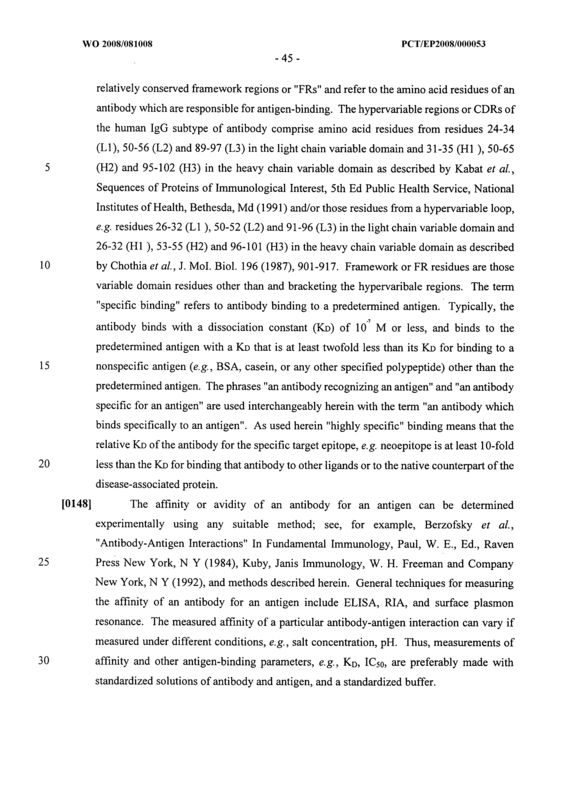 The binding molecule, antibody or binding fragment of any one of claims 14 to 25 or 33, which is detectably labeled. 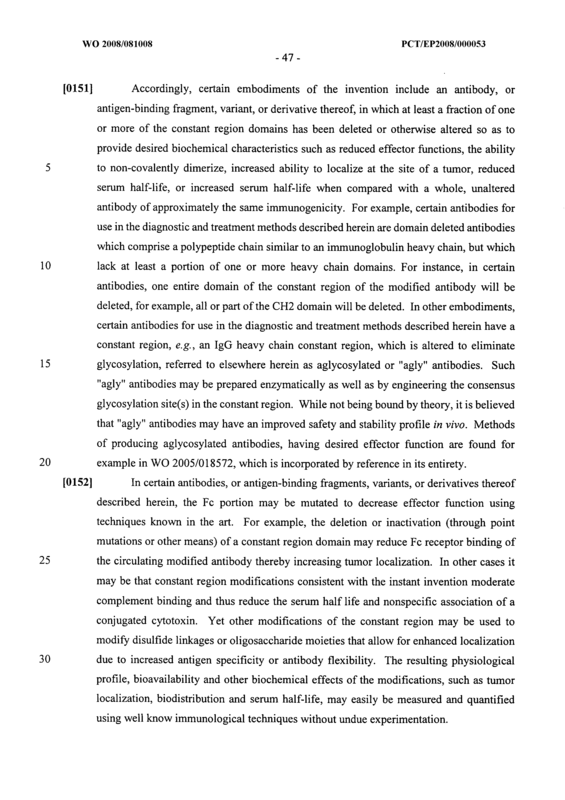 The binding molecule, antibody or binding fragment of claim 34, wherein the detectable label is selected from the group consisting of an enzyme, a radioisotope, a fluorophore and a heavy metal. 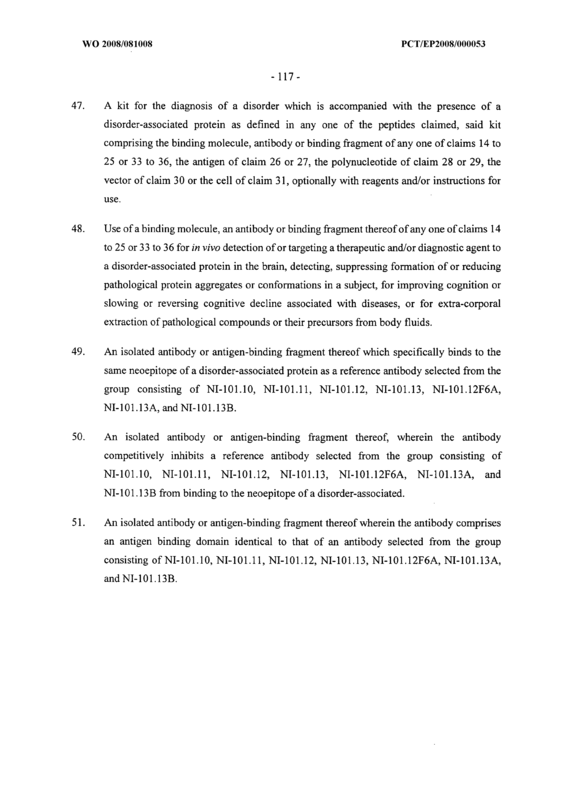 The binding molecule, antibody or binding fragment of any one of claims 14 to 25 or 33 to 35, which is attached to a drug. 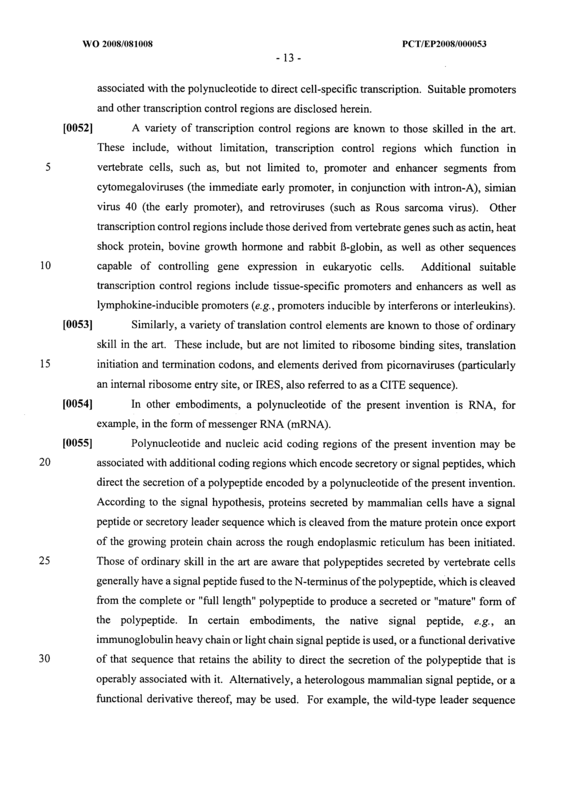 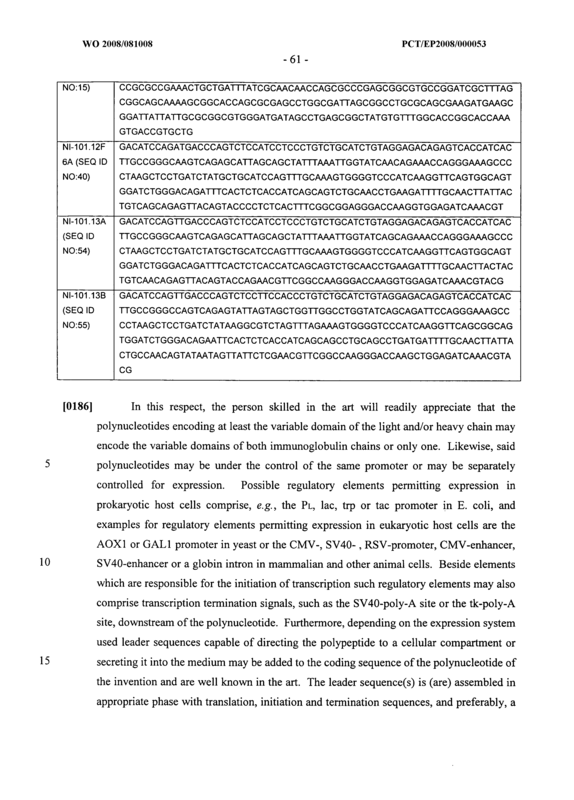 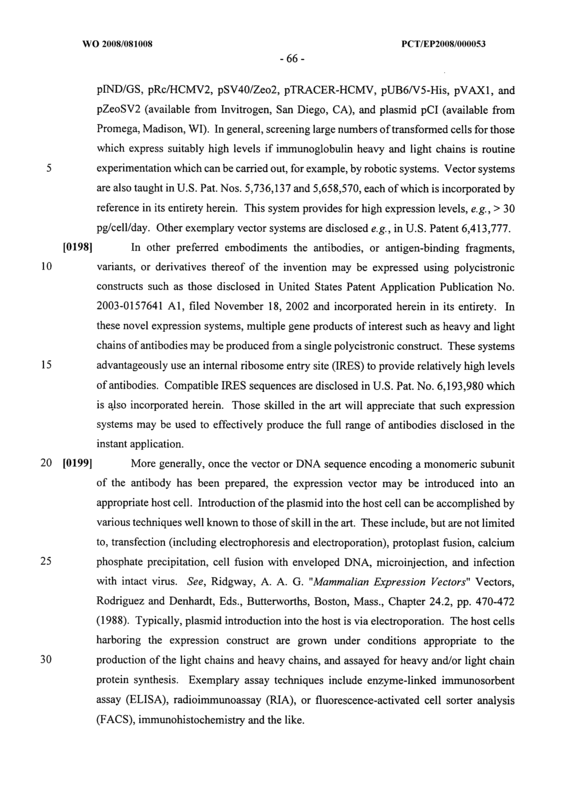 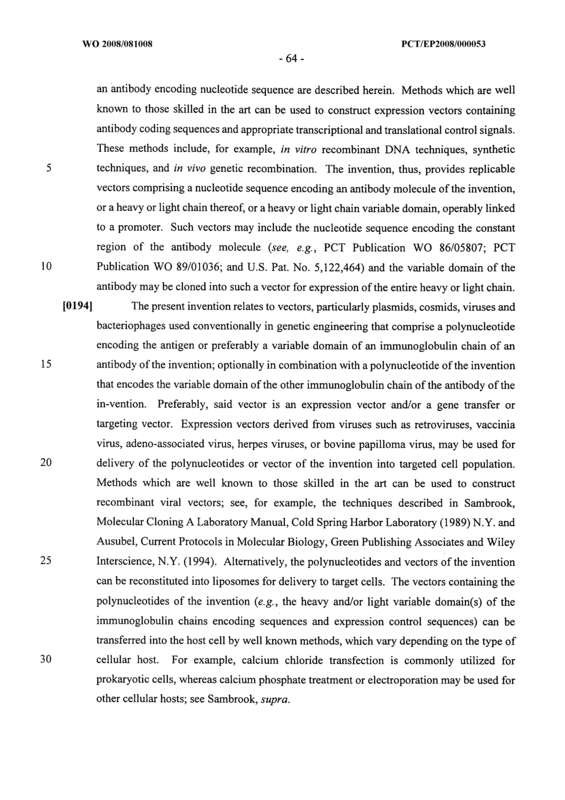 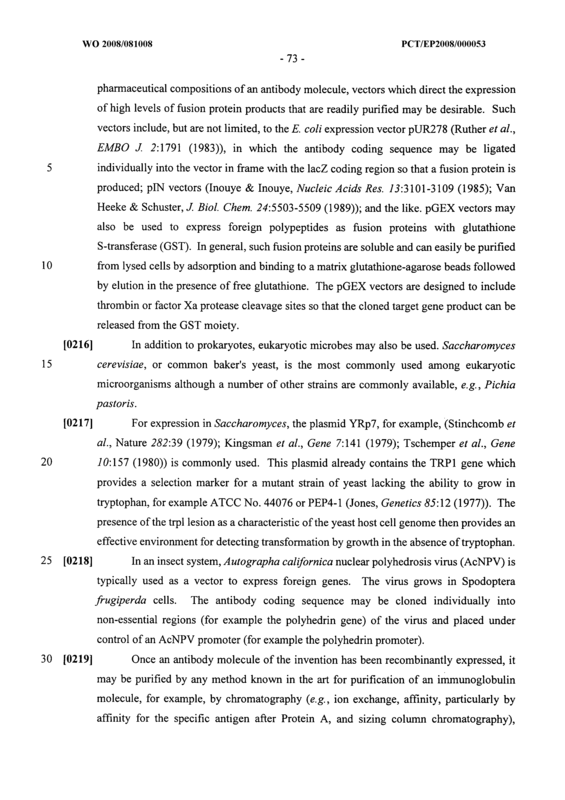 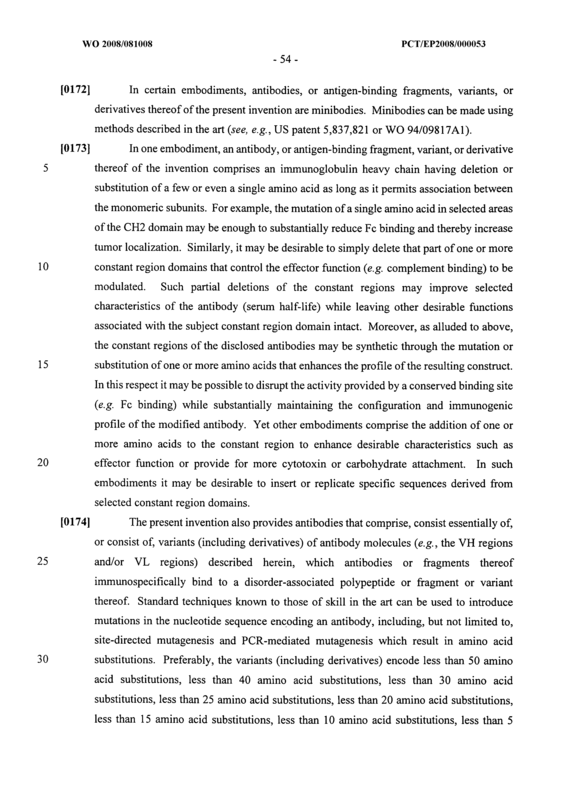 A composition comprising the binding molecule, antibody or binding fragment of any one of claims 14 to 25 or 33 to 36, the antigen of claim 26 or 27, the polynucleotide of claim 28 or 29, the vector of claim 30 or the cell of claim 31. 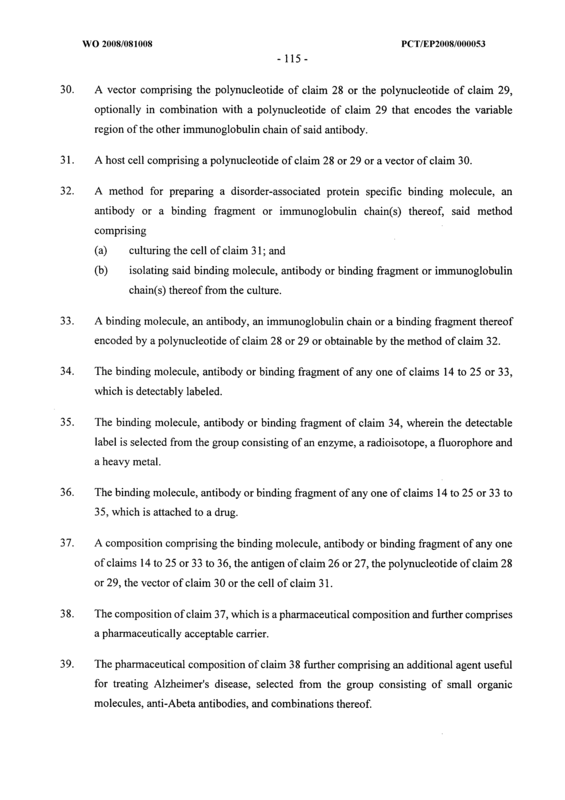 The composition of claim 37, which is a pharmaceutical composition and further comprises a pharmaceutically acceptable carrier. 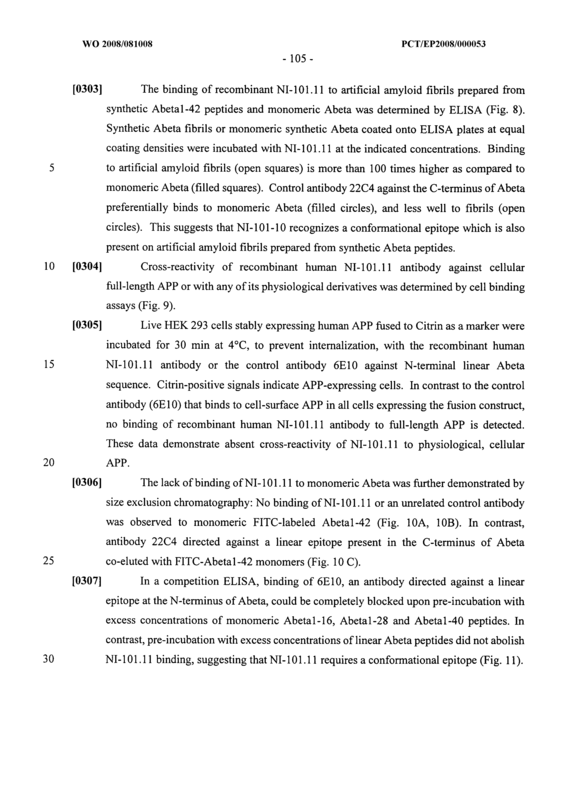 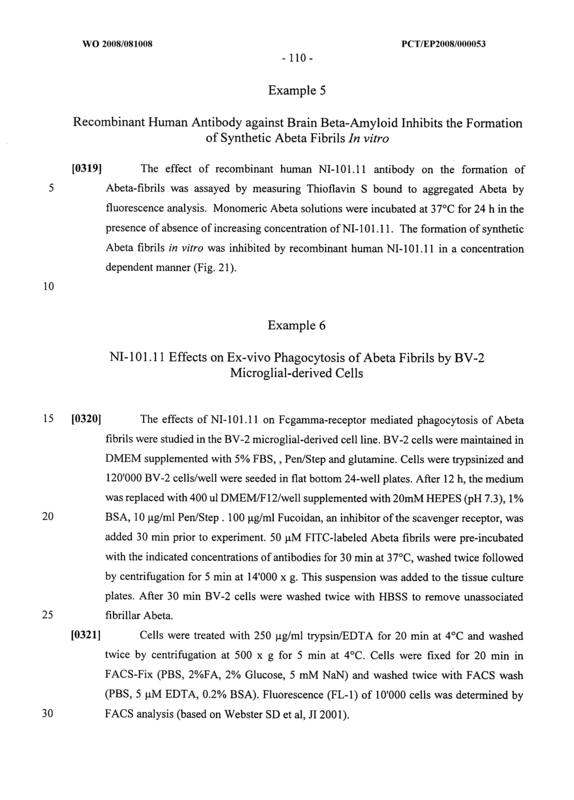 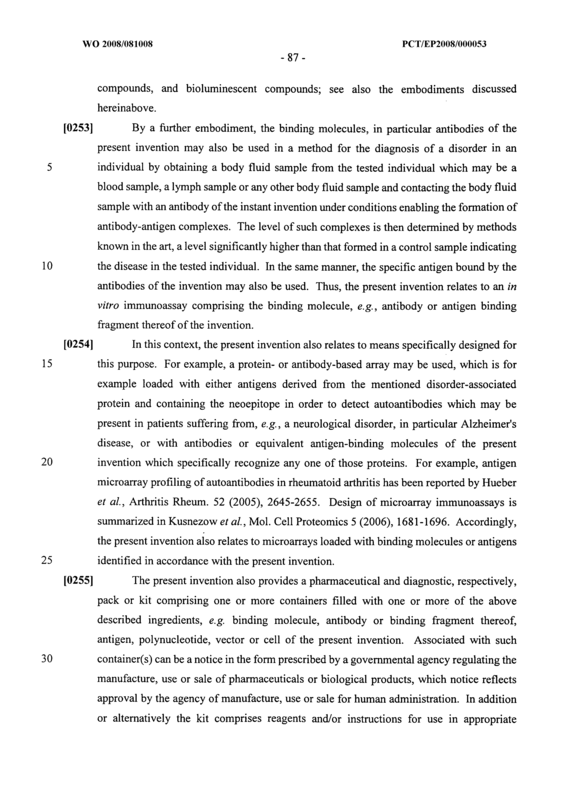 The pharmaceutical composition of claim 38 further comprising an additional agent useful for treating Alzheimer's disease, selected from the group consisting of small organic molecules, anti-Abeta antibodies, and combinations thereof. 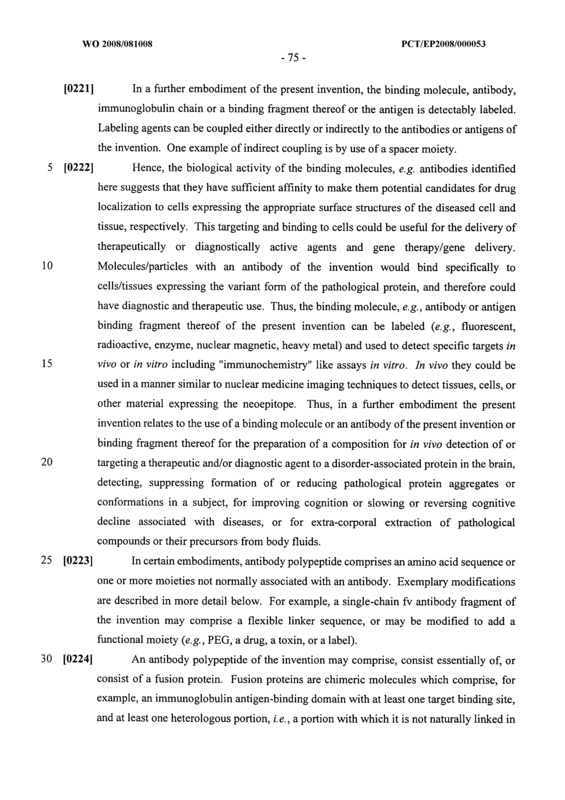 The composition of claim 37, which is a diagnostic composition and further comprises reagents conventionally used in immuno or nucleic acid based diagnostic methods. 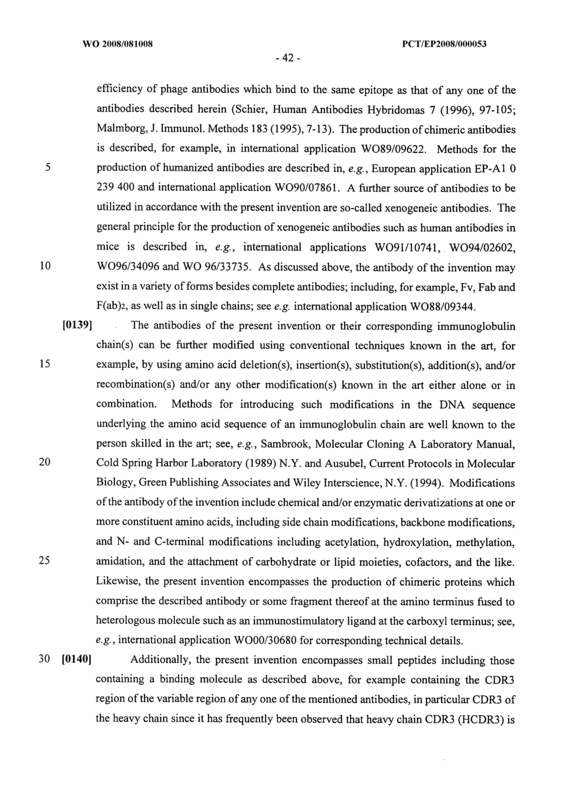 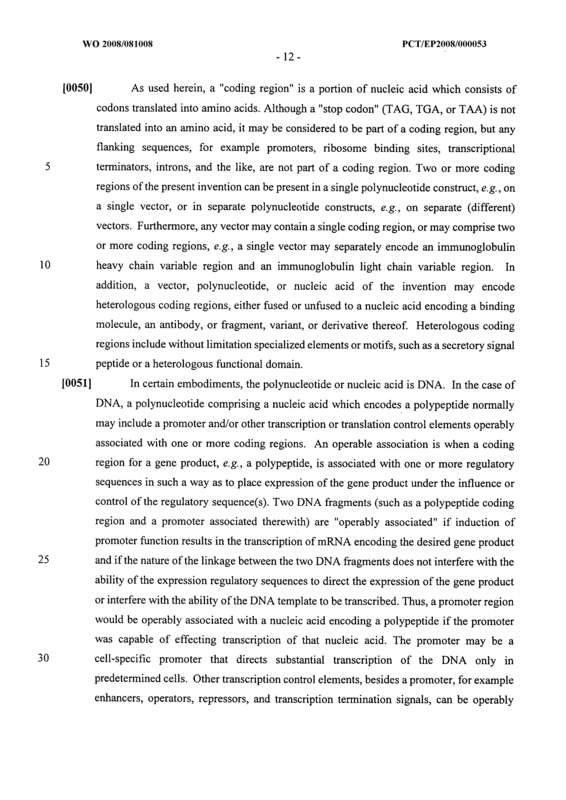 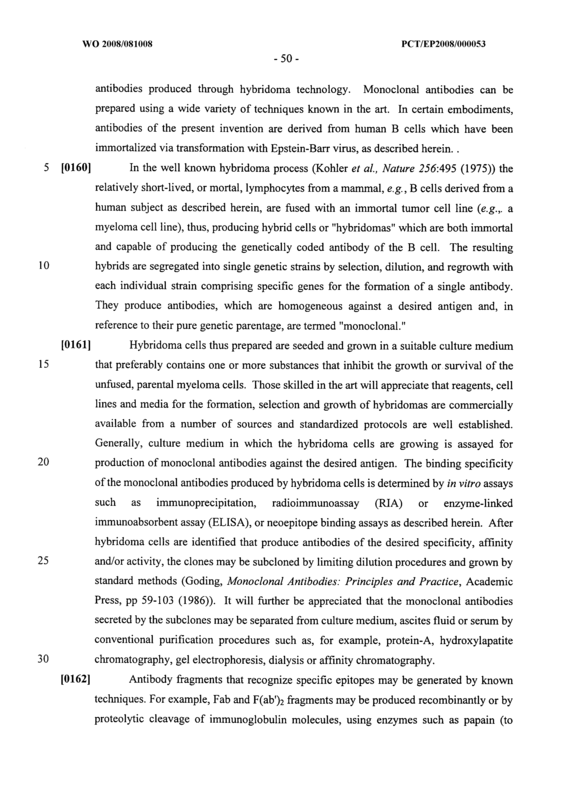 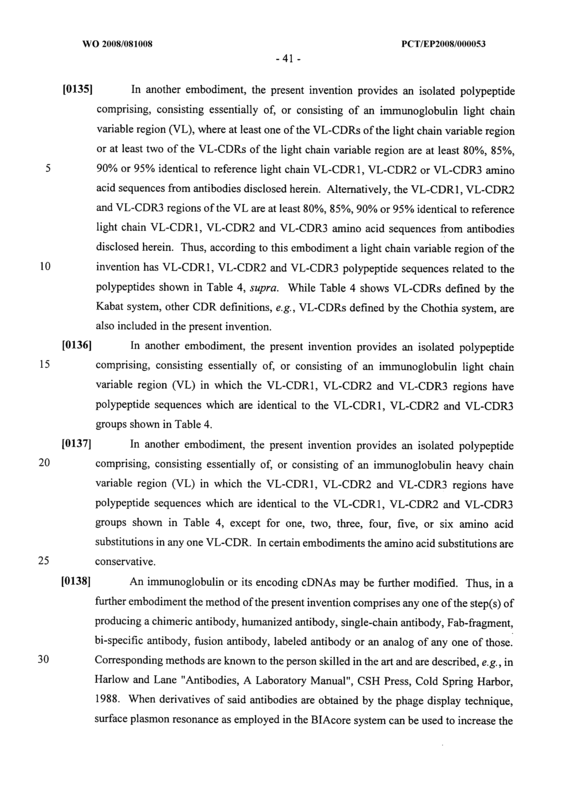 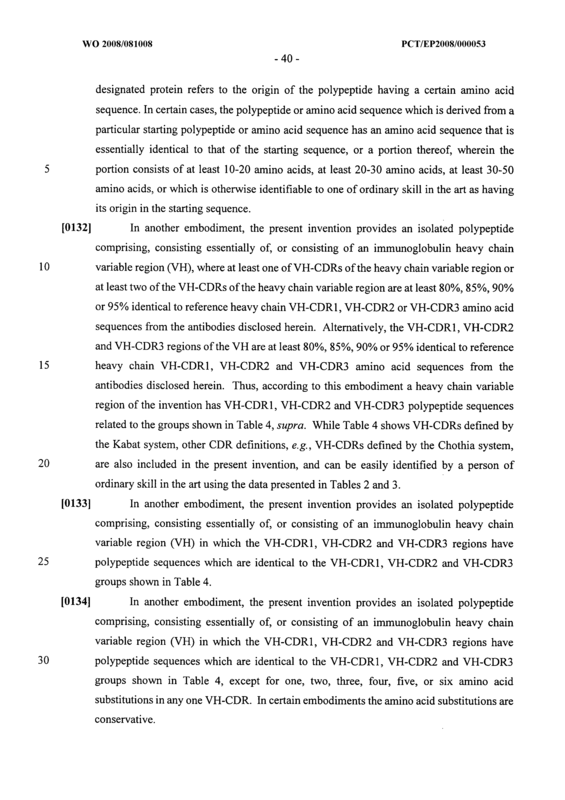 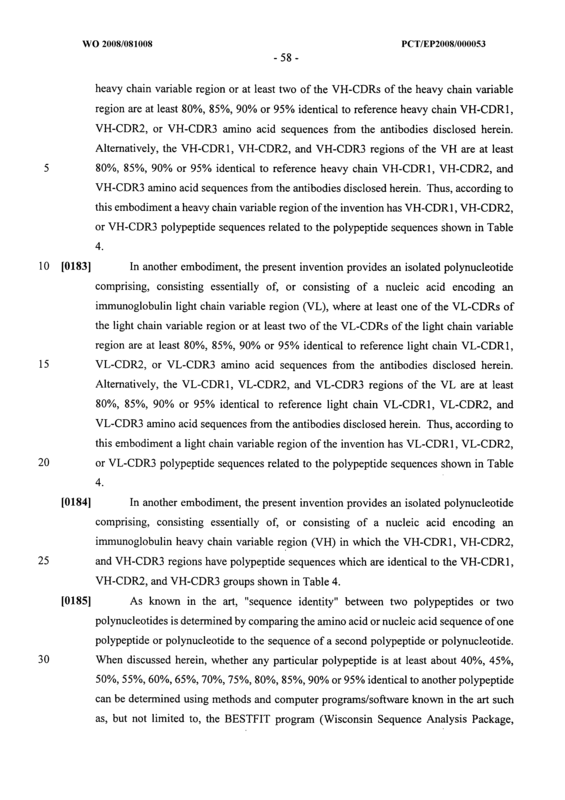 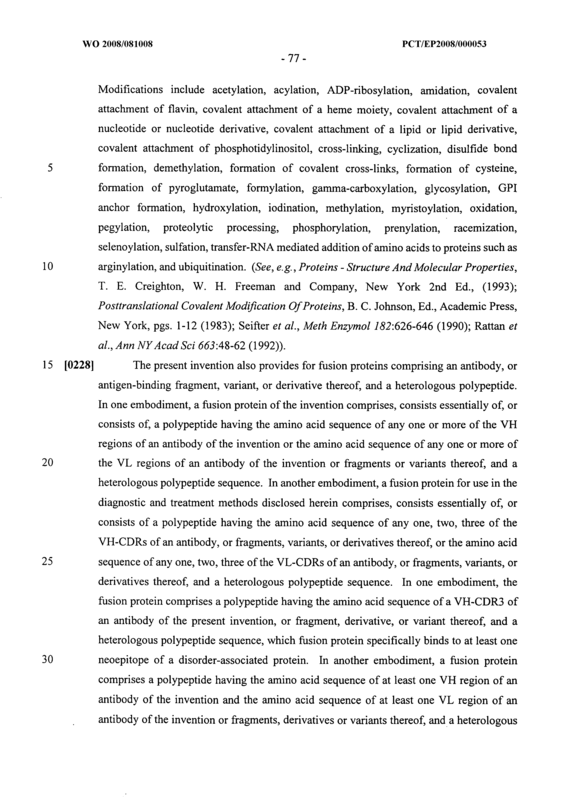 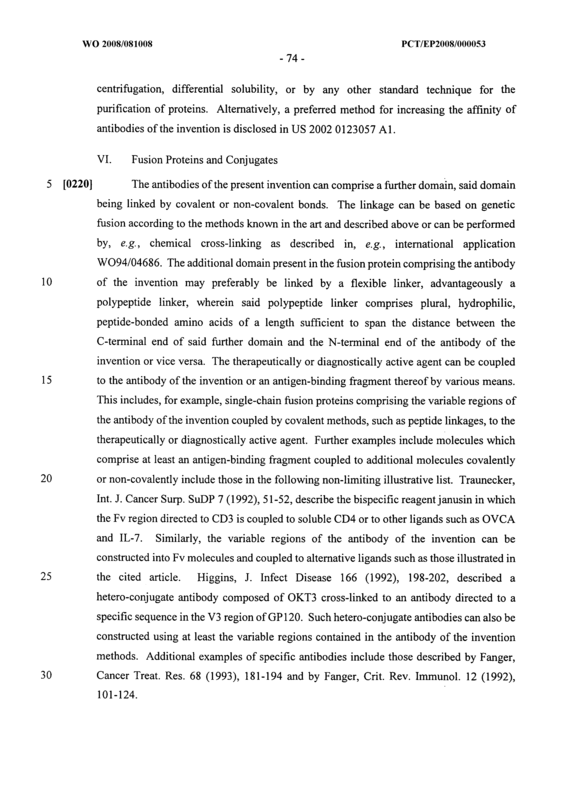 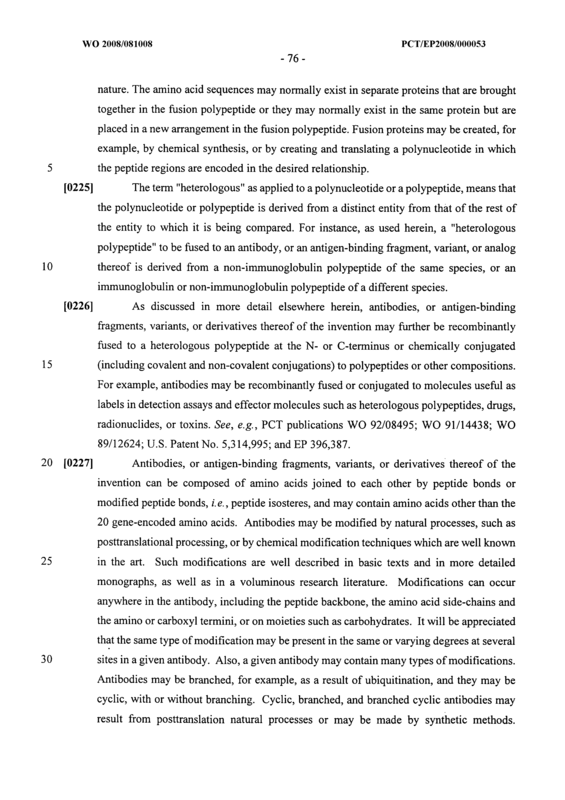 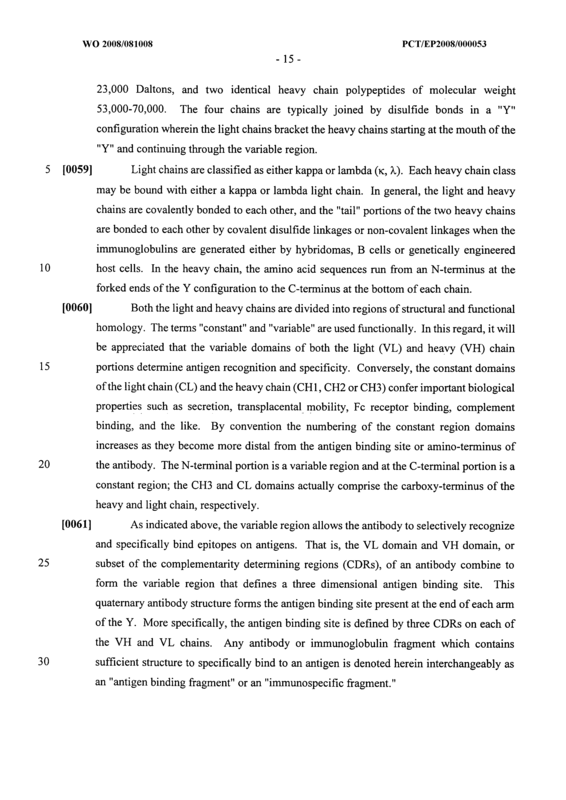 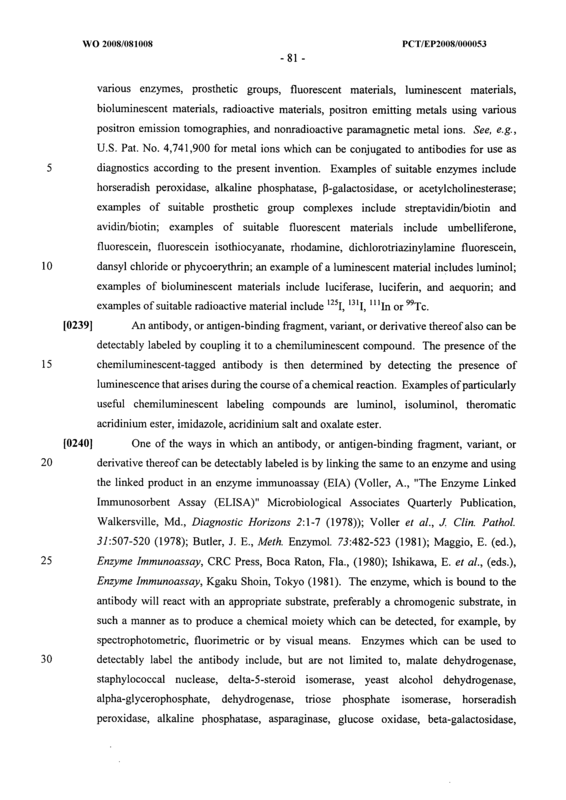 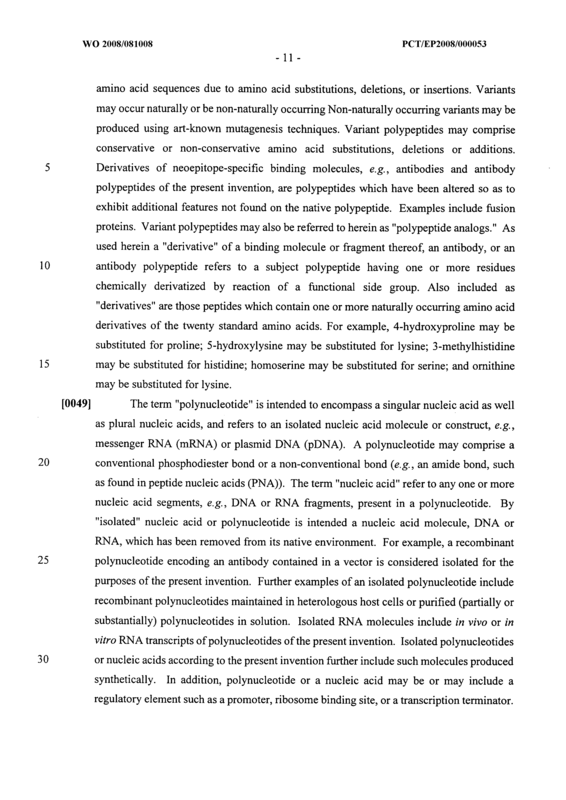 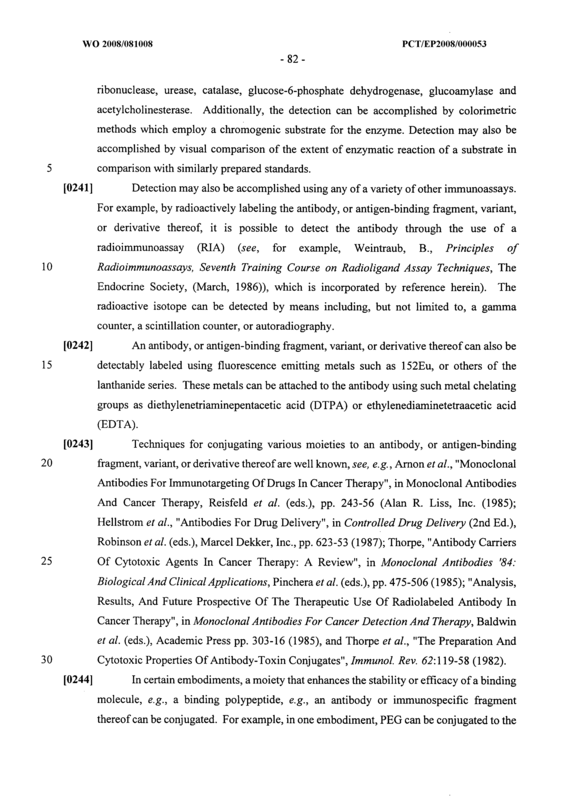 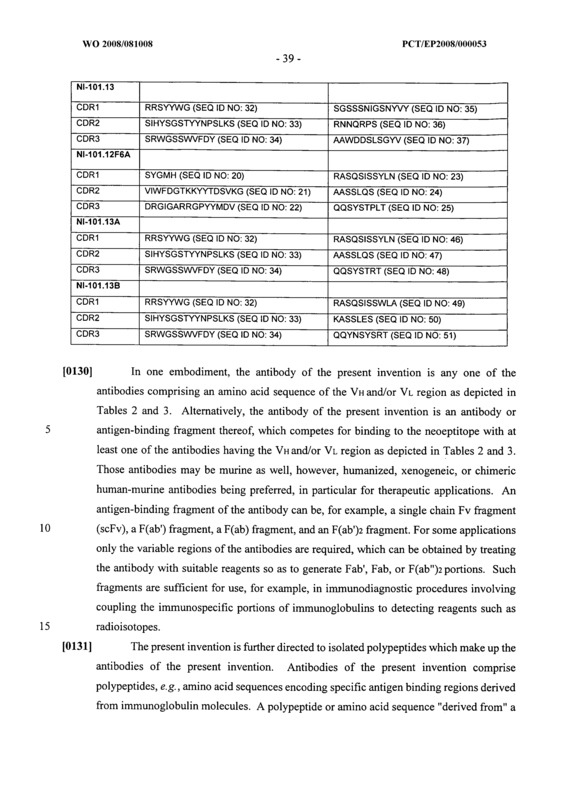 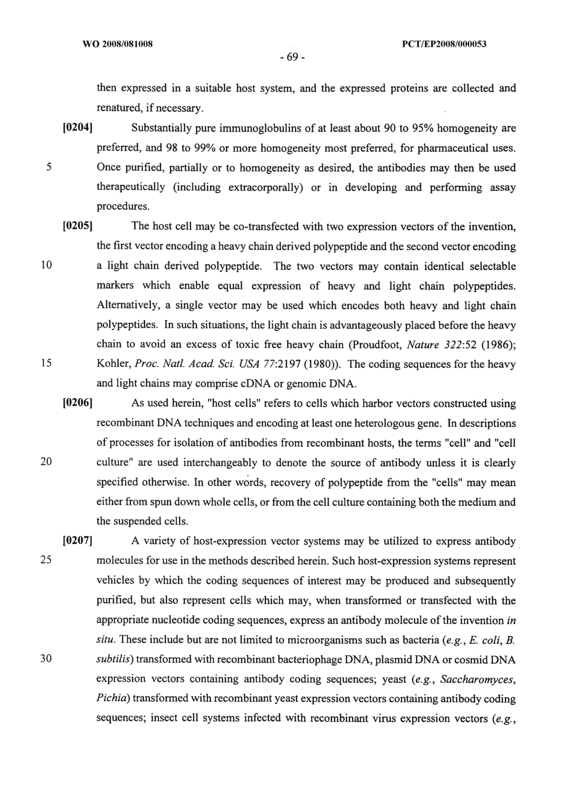 Use of the binding molecule, antibody or binding fragment of any one of claims 14 to 25 or 33 to 36 or of an antibody having substantially the same binding specificities of any one thereof, the antigen of claim 26 or 27, the polynucleotide of claim 28 or 29, the vector of claim 30 or the cell of claim 31 for the preparation of a pharmaceutical or diagnostic composition for treating or preventing the progression of Alzheimer's disease; for the amelioration of symptoms associated with Alzheimer's disease; for diagnosing or screening a subject for the presence of Alzheimer's disease or for determining a subject's risk for developing Alzheimer's disease. 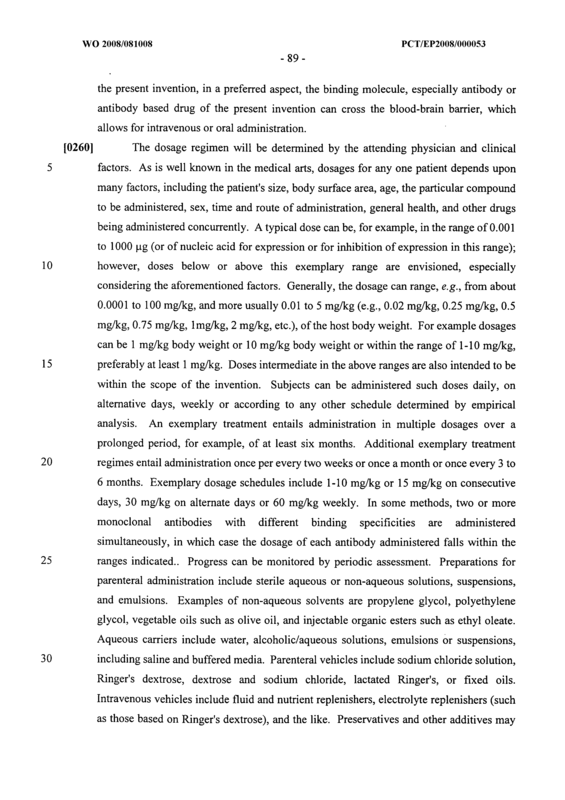 The use of claim 41, wherein said pharmaceutical composition is administered intravenously, intramuscularly, subcutaneously, intraperitoneally, intranasally, parenterally or as an aerosol. 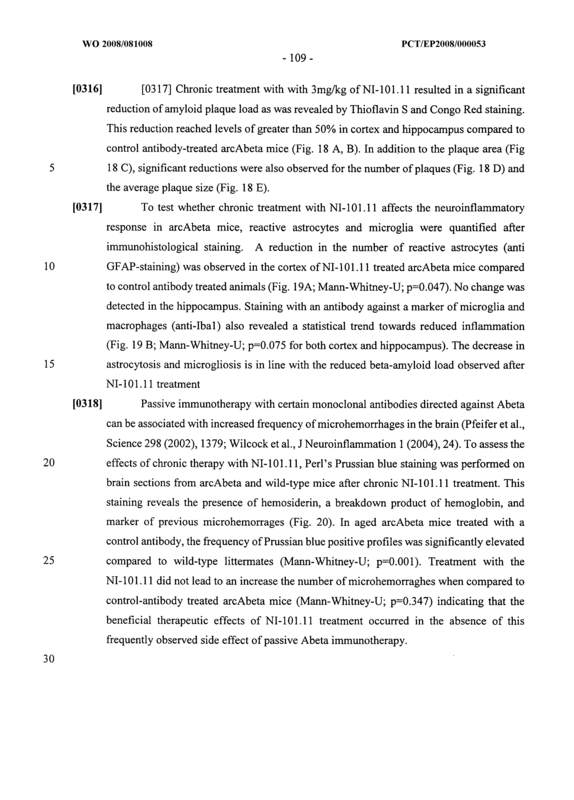 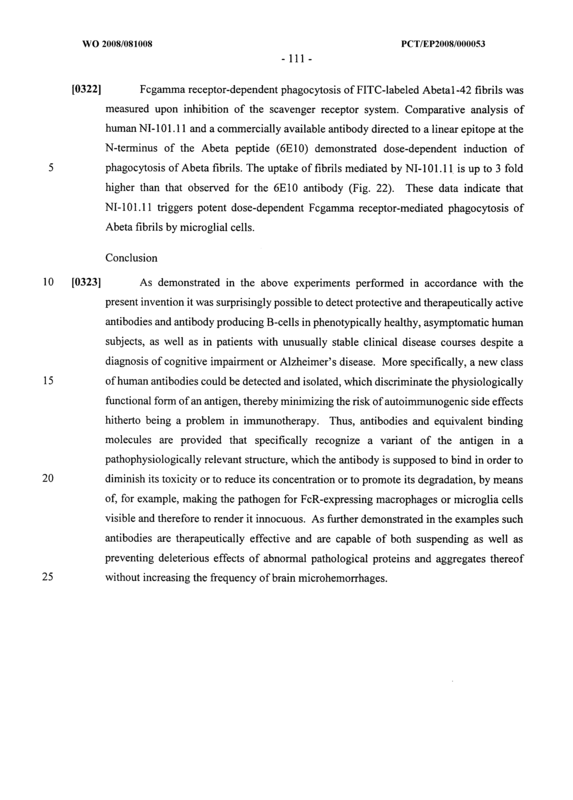 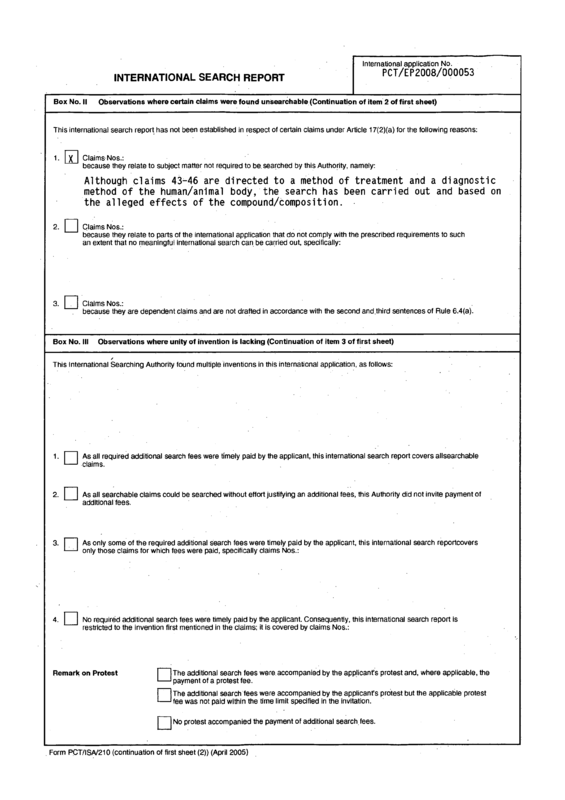 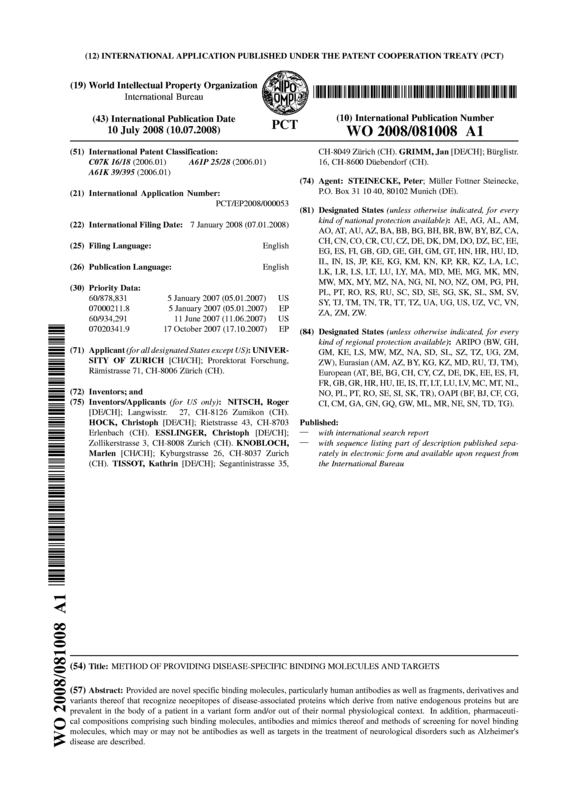 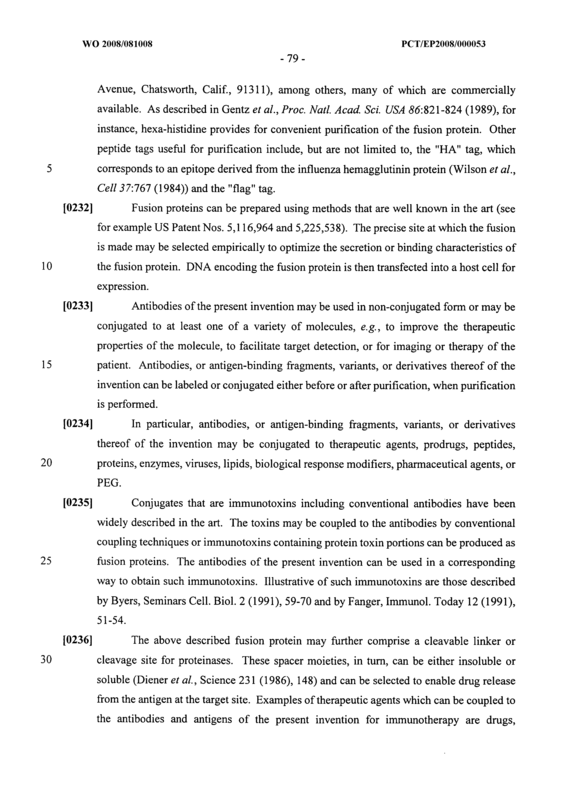 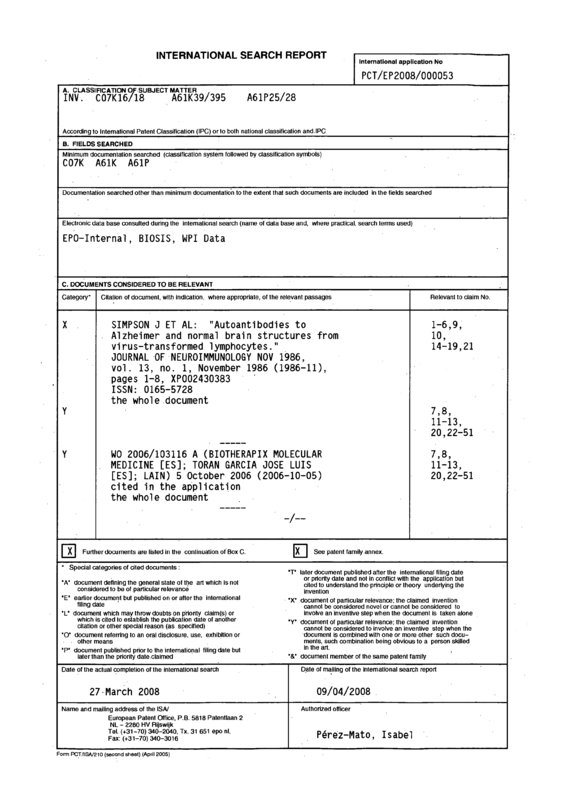 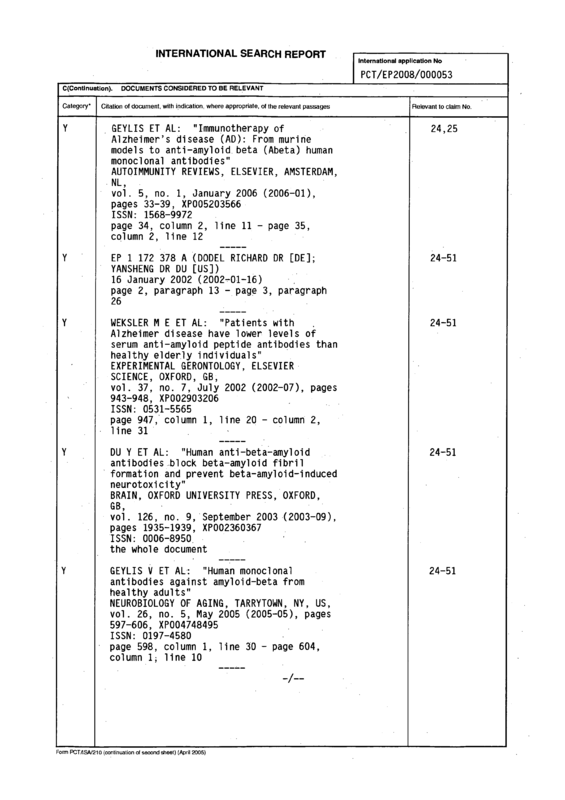 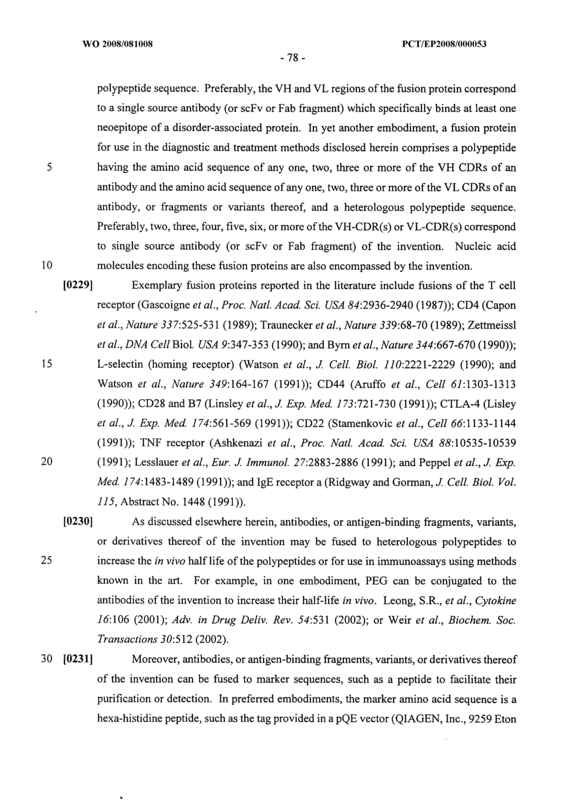 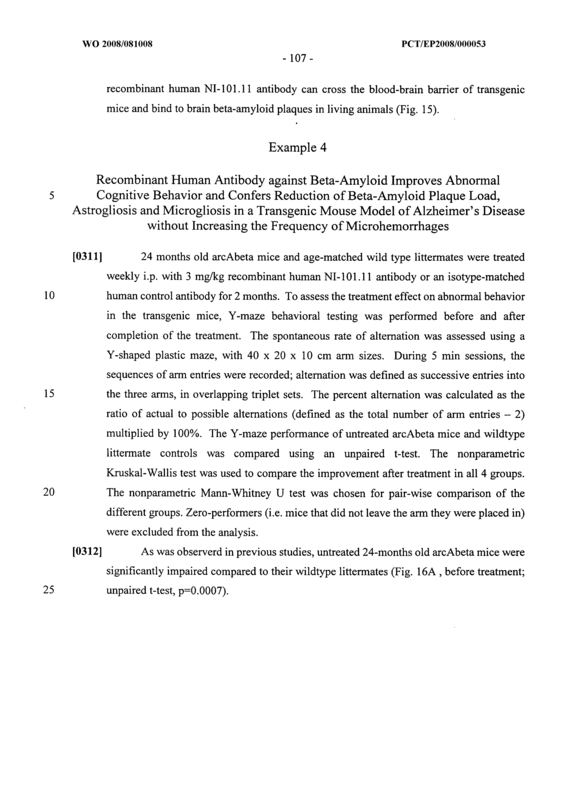 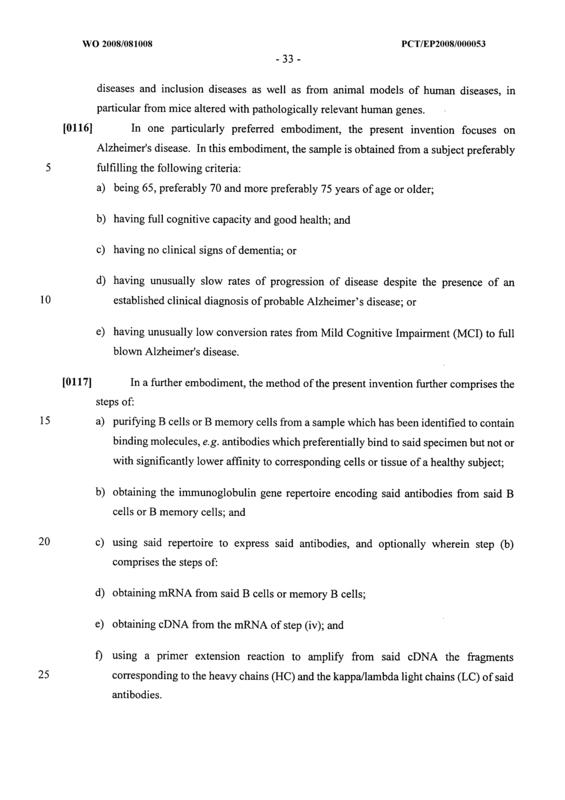 A method of treating a neurological disorder characterized by abnormal accumulation and/or deposition of a protein in the central nervous system, which method comprises administering to a subject in need thereof a therapeutically effective amount of the binding molecule of any one of claims 14 to 25 or 33 to 36, the antigen of claim 26 or 27, the polynucleotide of claim 28 or 29, the vector of claim 30 or the cell of claim 31. 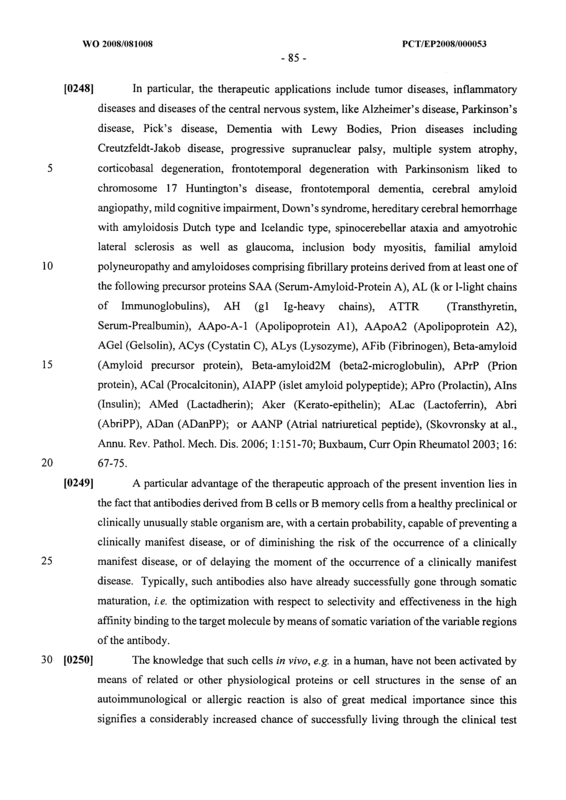 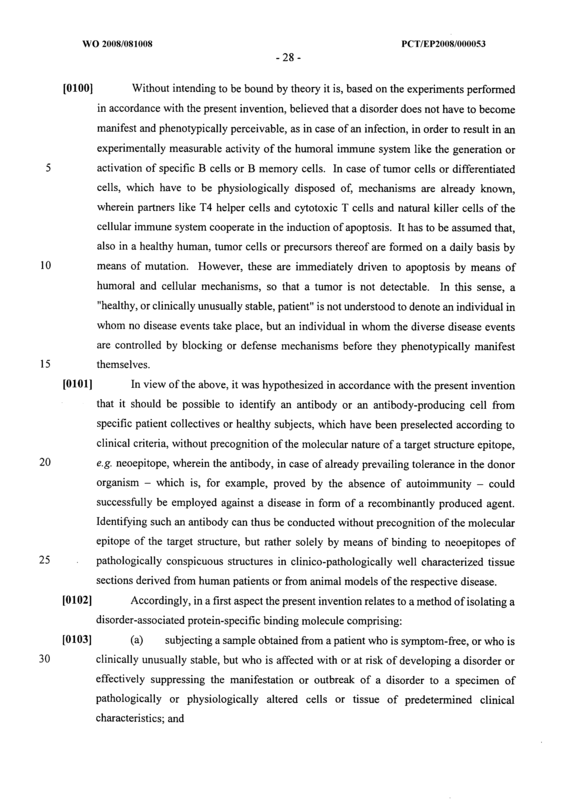 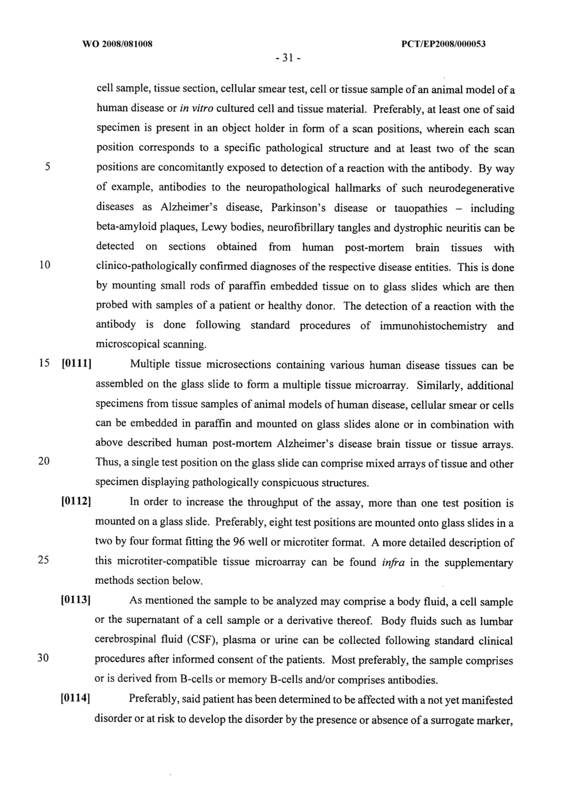 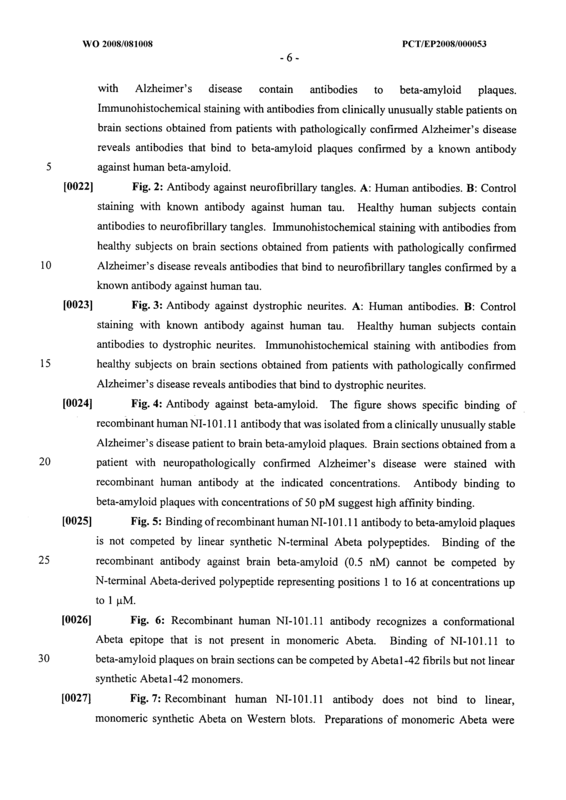 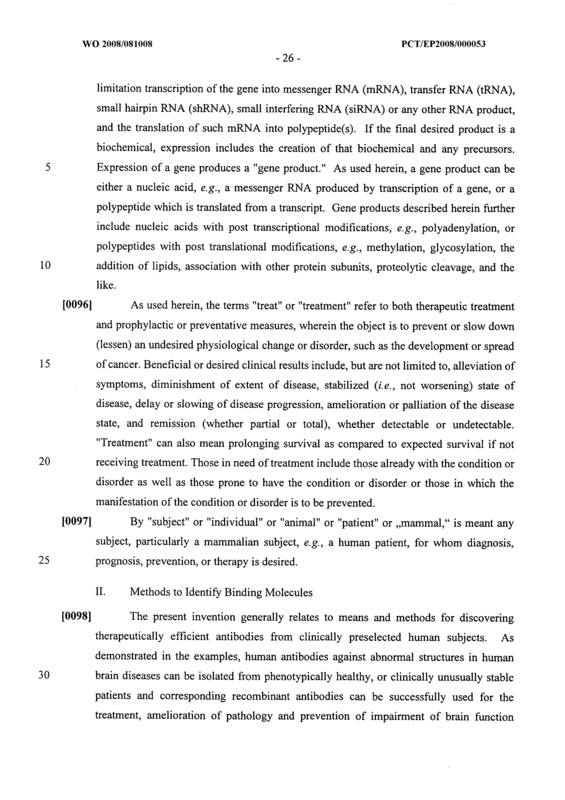 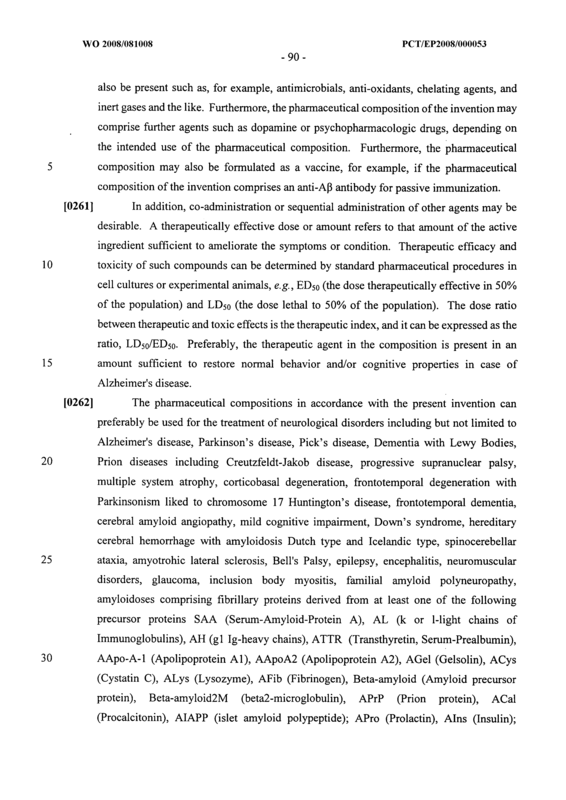 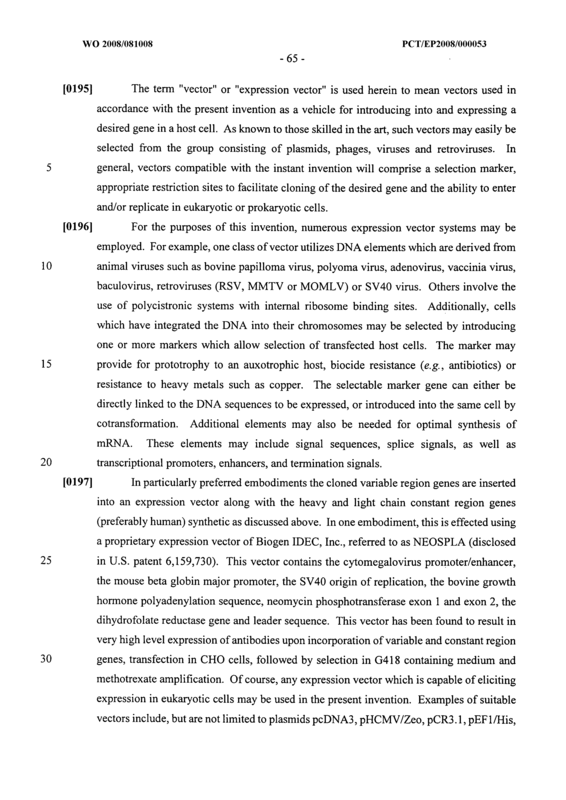 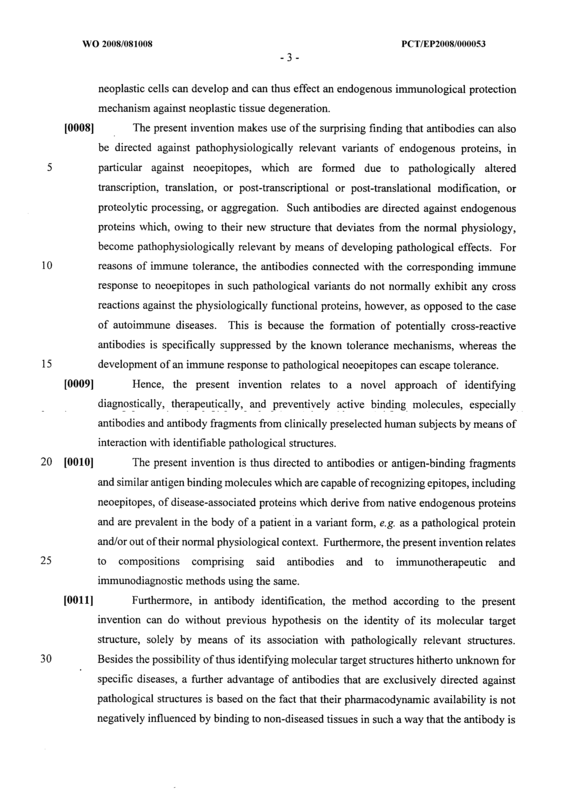 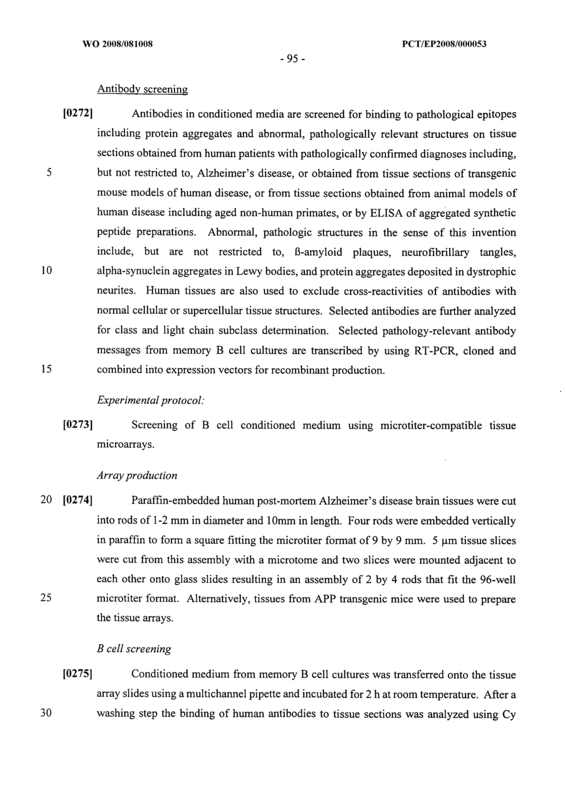 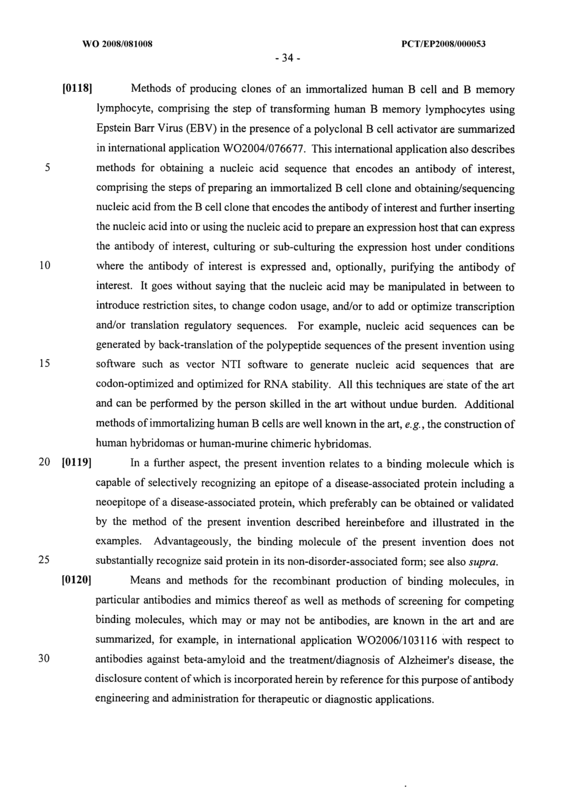 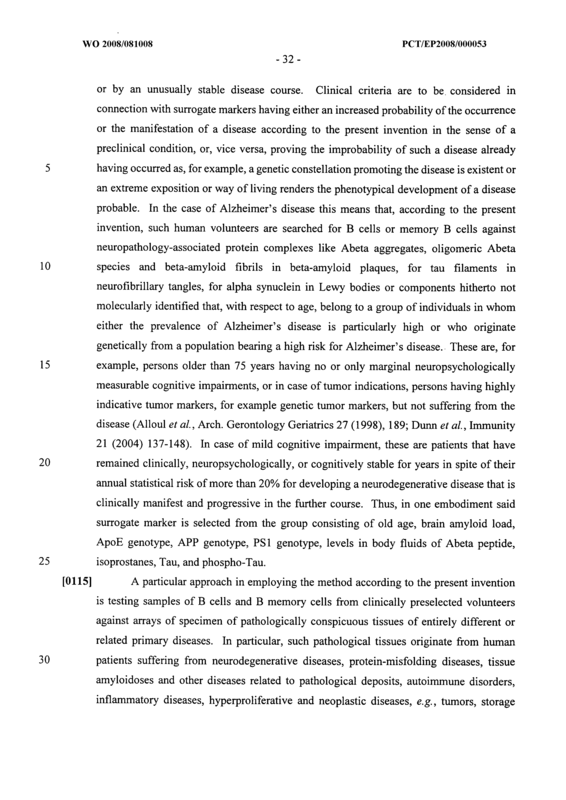 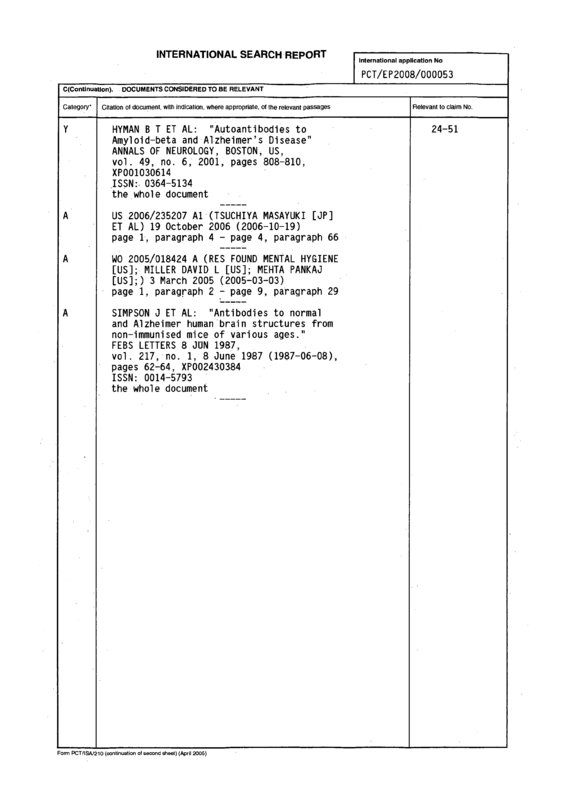 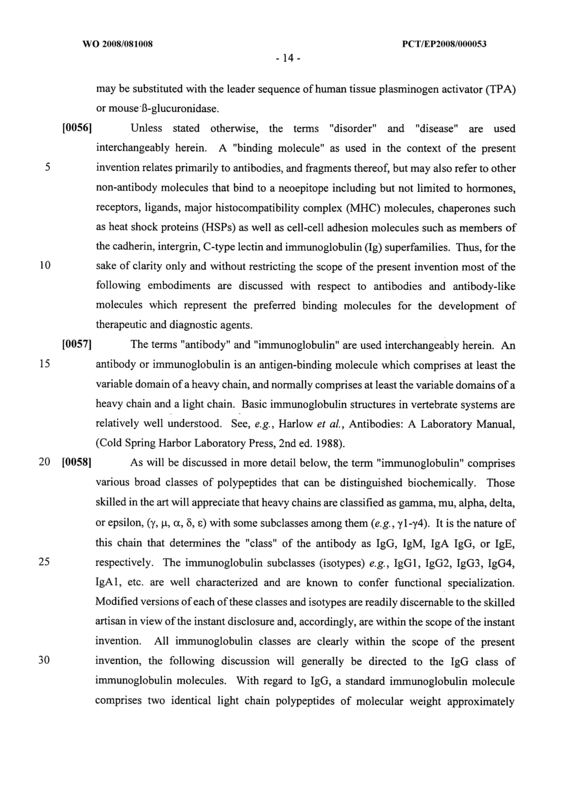 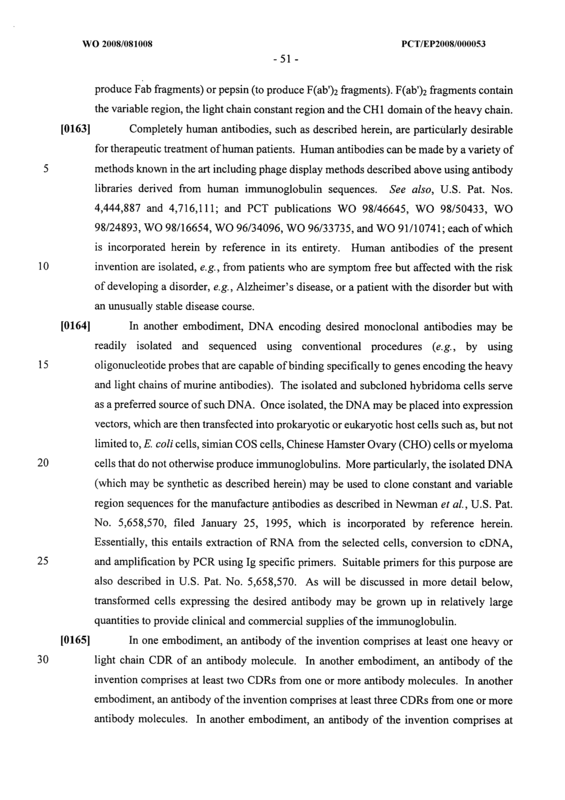 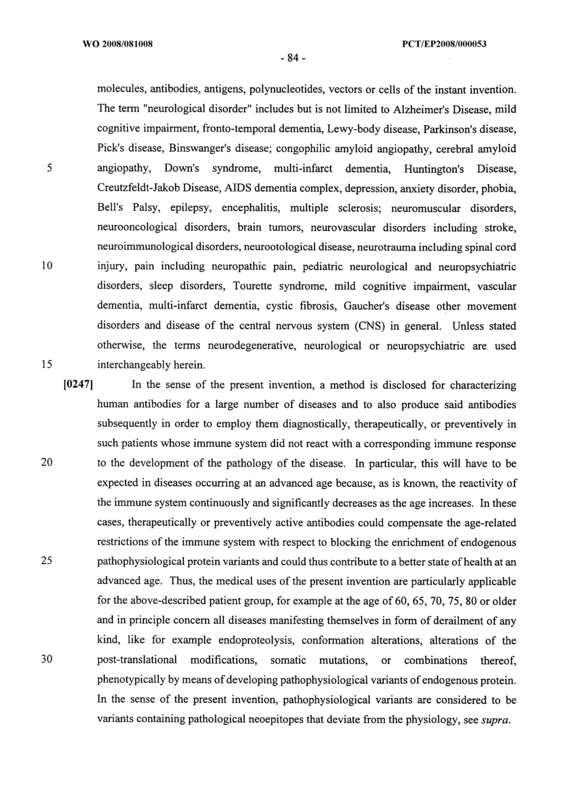 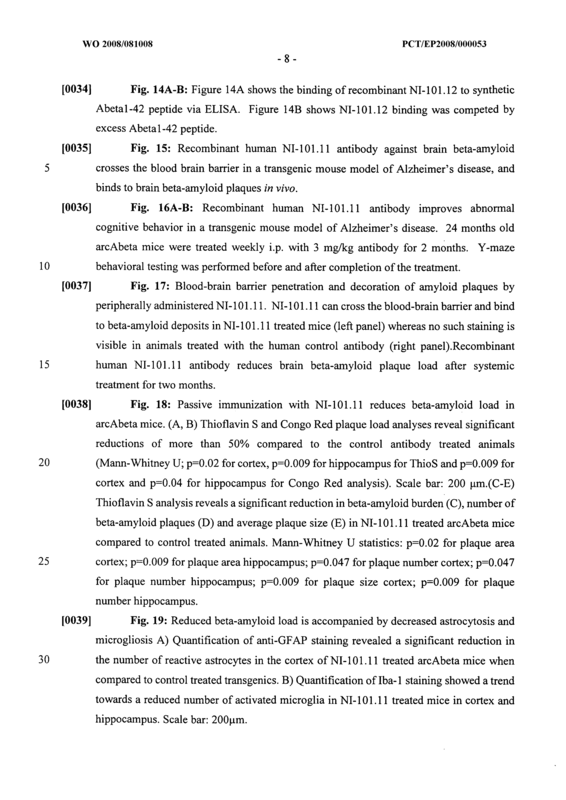 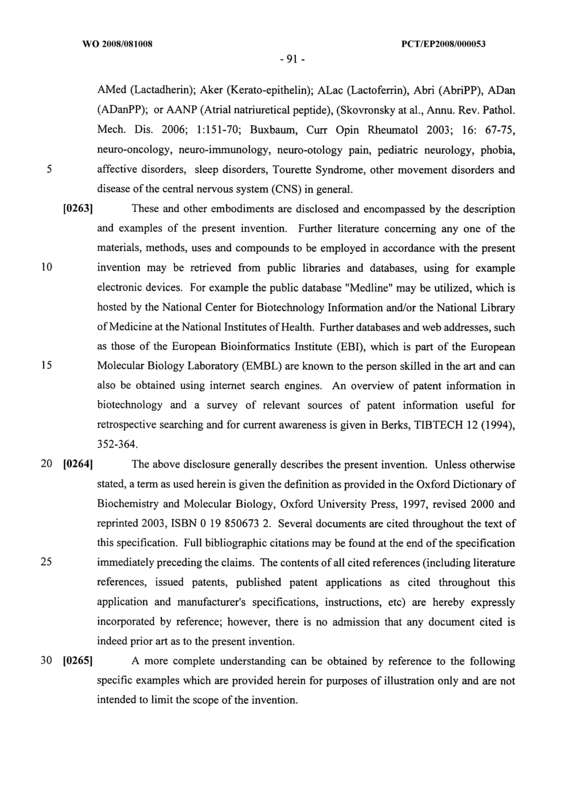 The method of claim 43, wherein said disorder is selected from the group consisting of Alzheimer's disease, Down's syndrome, mild cognitive impairment, cerebral amyloid angiopathy, vascular dementia, multi-infarct dementia, Parkinson's disease, Huntington's disease, Creutzfeldt- Jakob disease, cystic fibrosis, or Gaucher's disease. 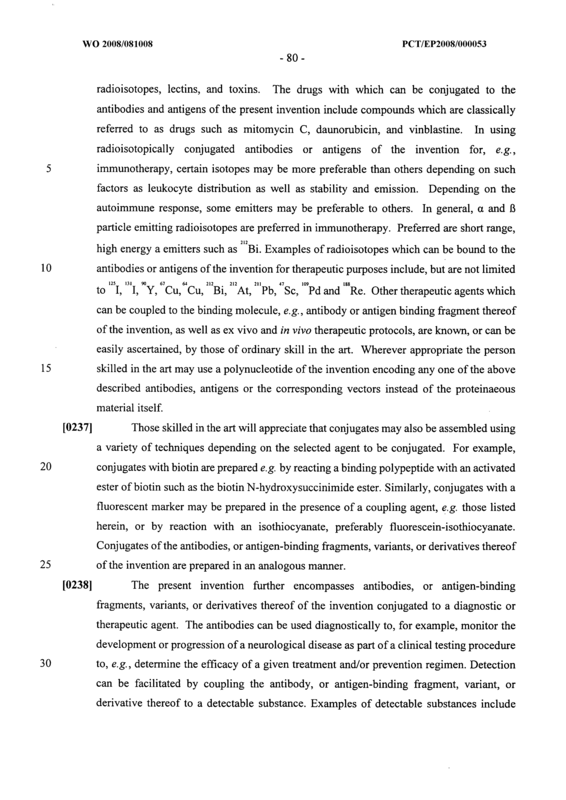 The method of claim 43 or 44, wherein administration is performed intravenously, intramuscularly, subcutaneously, intraperitoneally, intranasally, parenterally or as an aerosol. 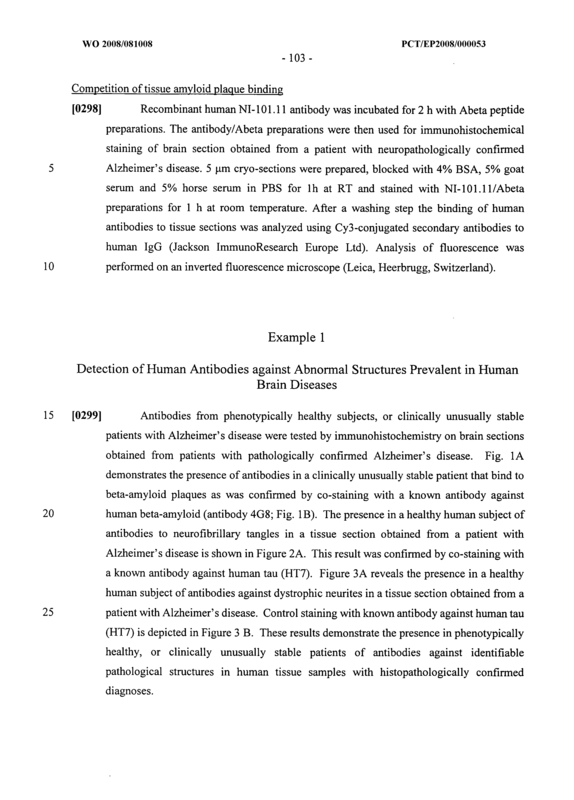 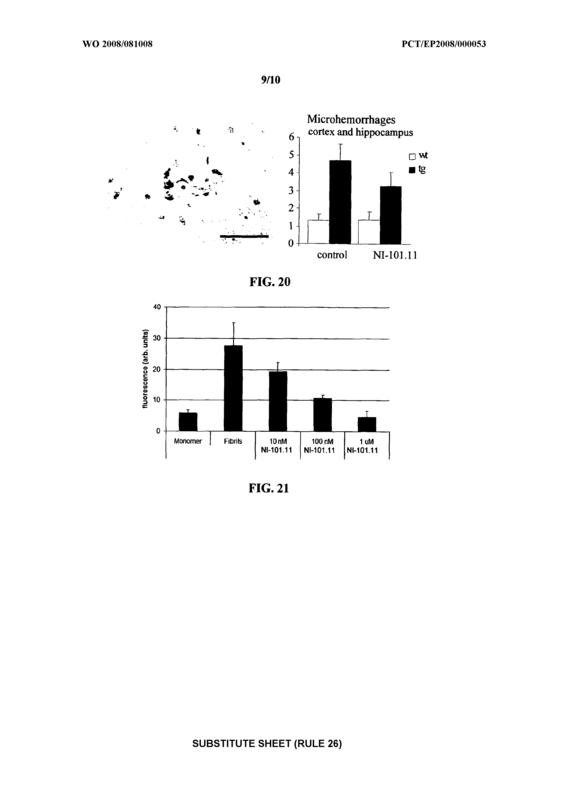 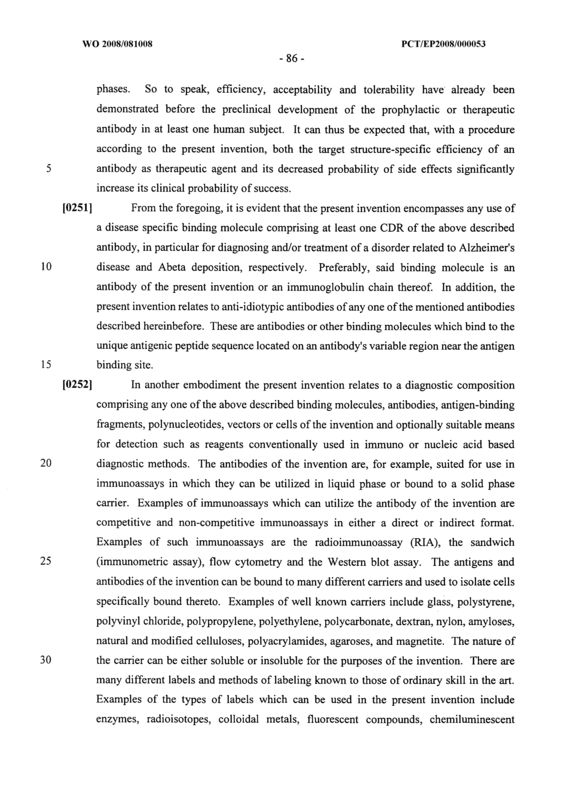 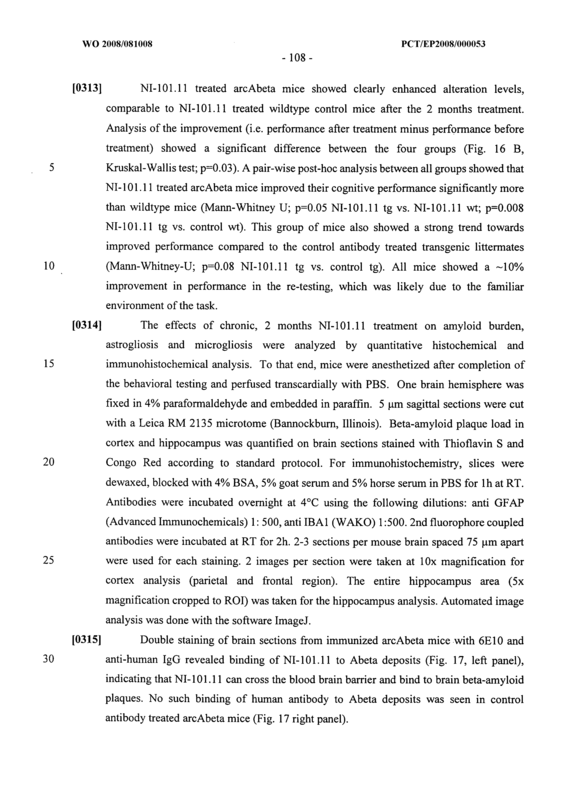 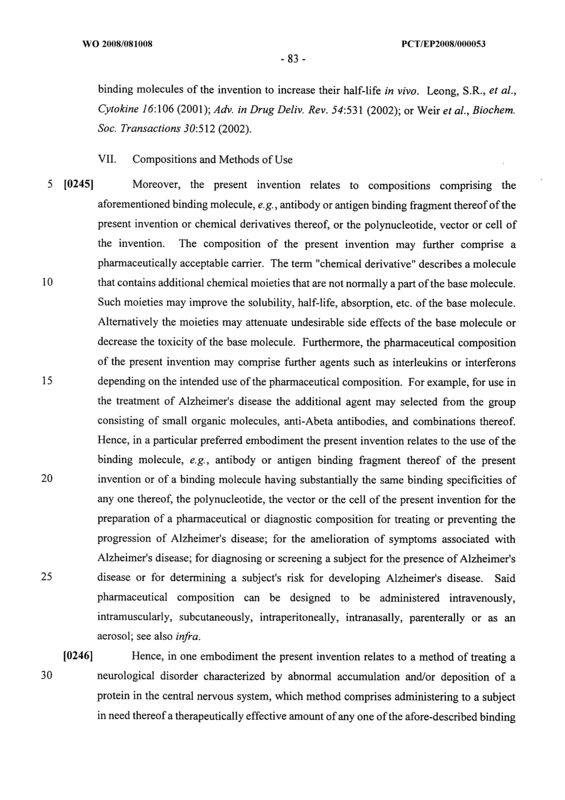 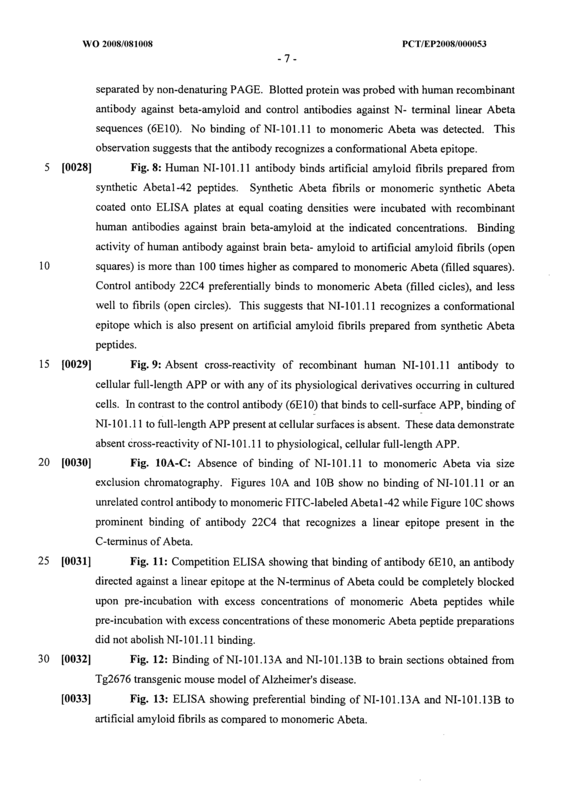 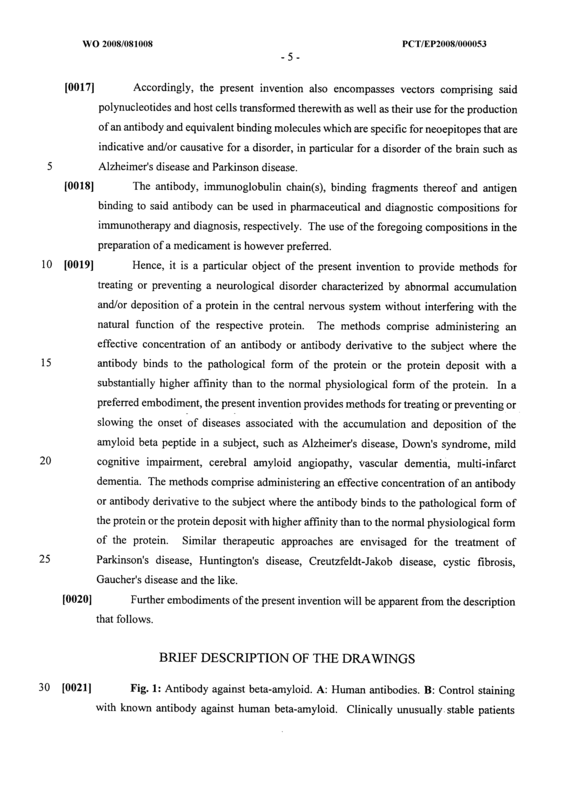 A method of diagnosing and/or treating a disorder related to Alzheimer's disease and Abeta deposition, respectively, comprising administering to a subject a therapeutically effective amount of a ligand Abeta-binding molecule comprising at least one CDR of the antibody or binding fragment of claim 24 or 25 or a corresponding anti-idiotypic antibody. 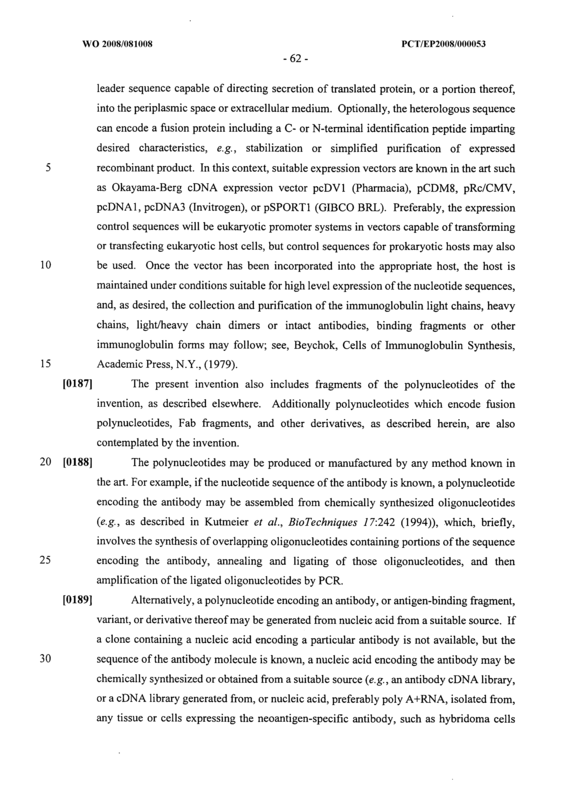 A kit for the diagnosis of a disorder which is accompanied with the presence of a disorder-associated protein as defined in any one of the peptides claimed, said kit comprising the binding molecule, antibody or binding fragment of any one of claims 14 to 25 or 33 to 36, the antigen of claim 26 or 27, the polynucleotide of claim 28 or 29, the vector of claim 30 or the cell of claim 31, optionally with reagents and/or instructions for use. 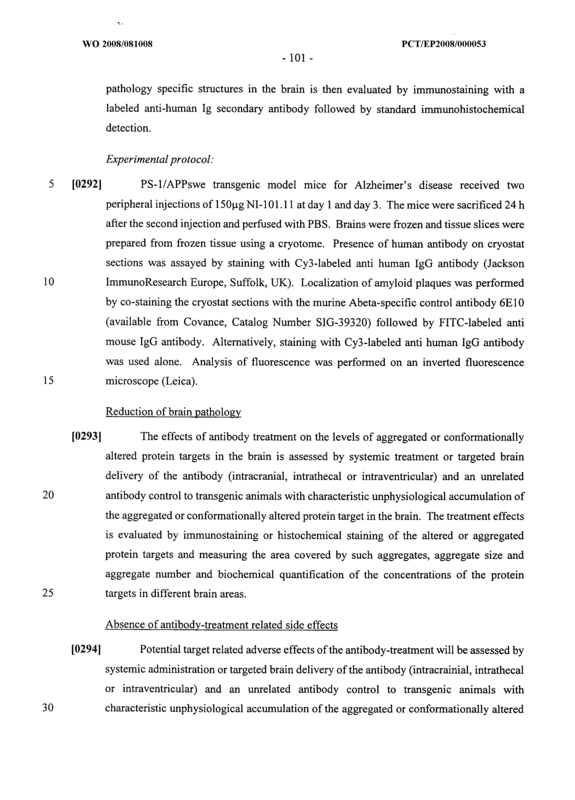 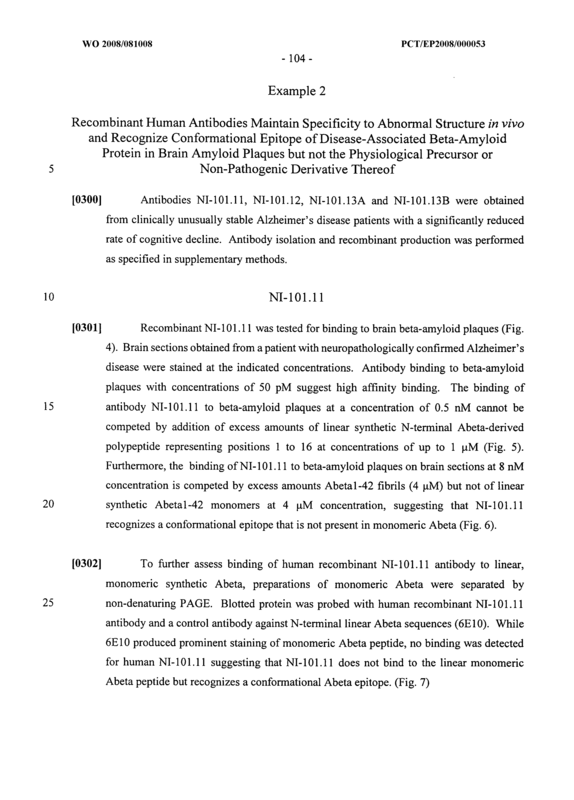 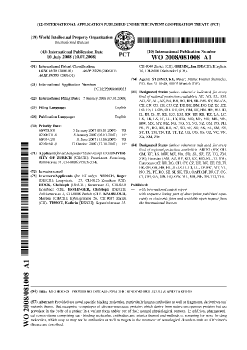 Use of a binding molecule, an antibody or binding fragment thereof of any one of claims 14 to 25 or 33 to 36 for in vivo detection of or targeting a therapeutic and/or diagnostic agent to a disorder-associated protein in the brain, detecting, suppressing formation of or reducing pathological protein aggregates or conformations in a subject, for improving cognition or slowing or reversing cognitive decline associated with diseases, or for extra-corporal extraction of pathological compounds or their precursors from body fluids. 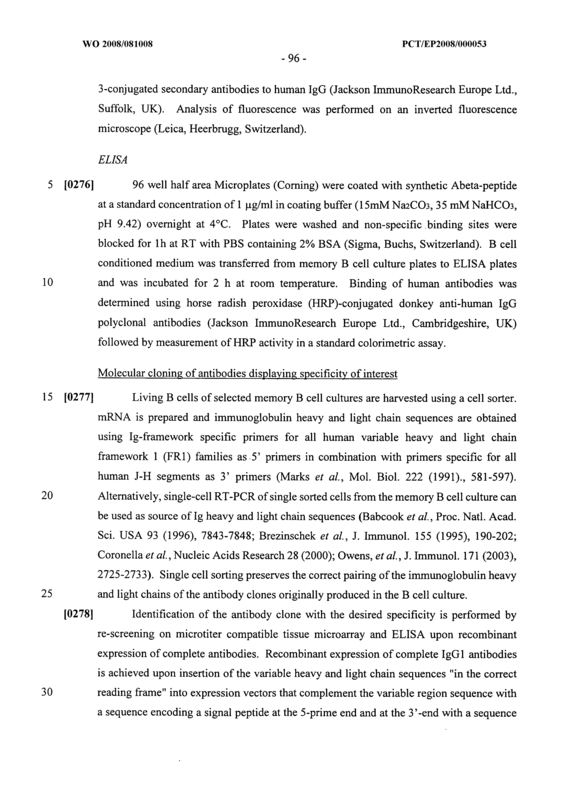 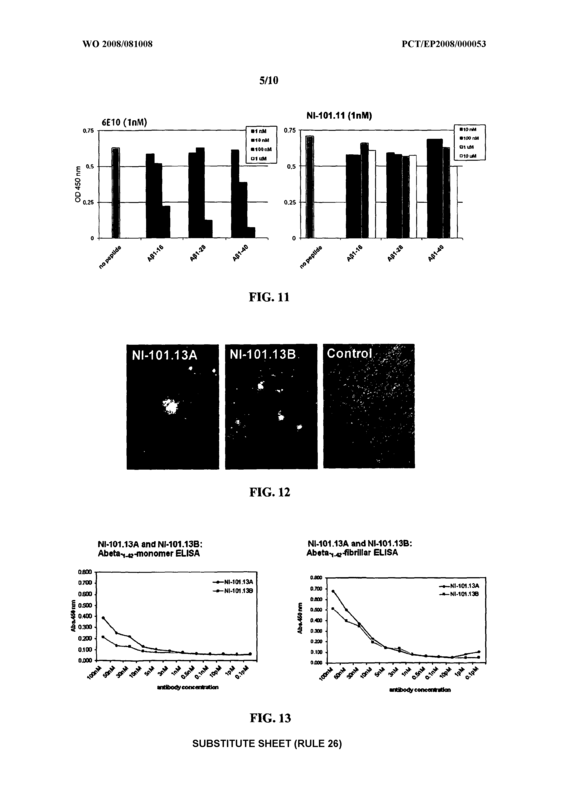 An isolated antibody or antigen-binding fragment thereof which specifically binds to the same neoepitope of a disorder-associated protein as a reference antibody selected from the group consisting of NI-IOl.10, NI-101.11, NI-101.12, NI-101.13, NI-101.12F6A, NI-101.13A, and NI-101.13B. 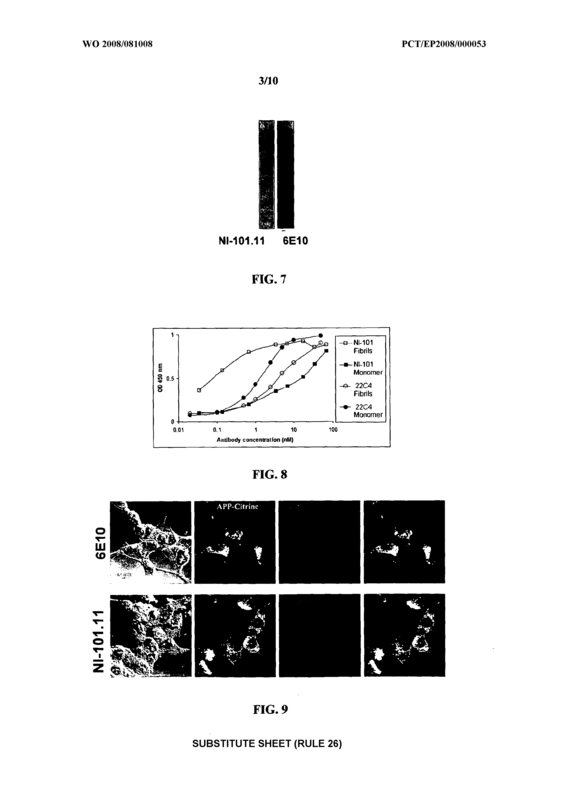 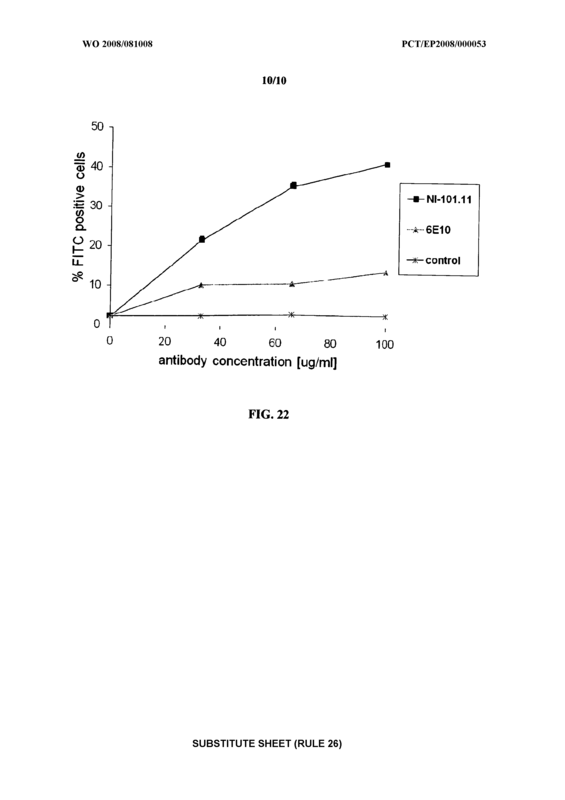 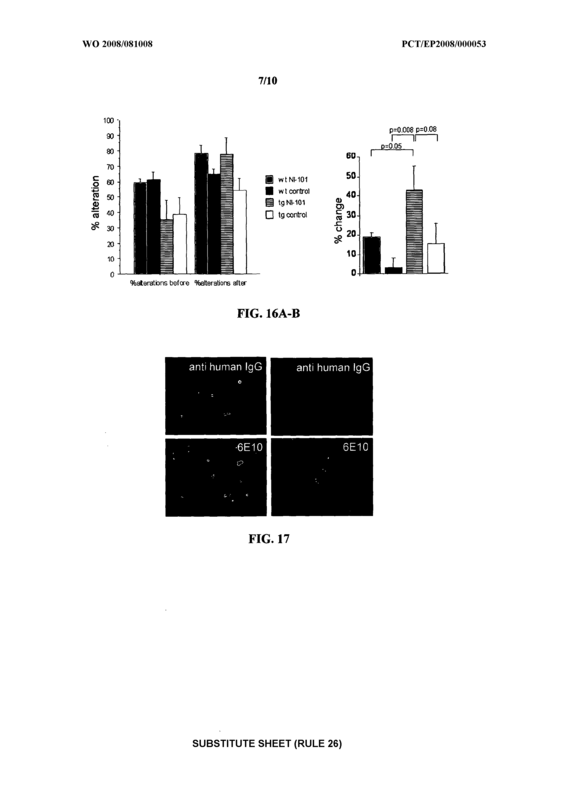 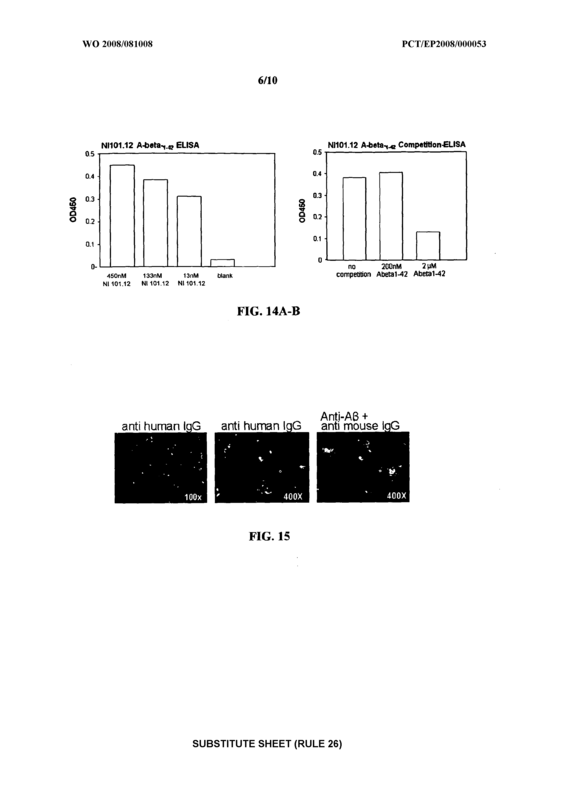 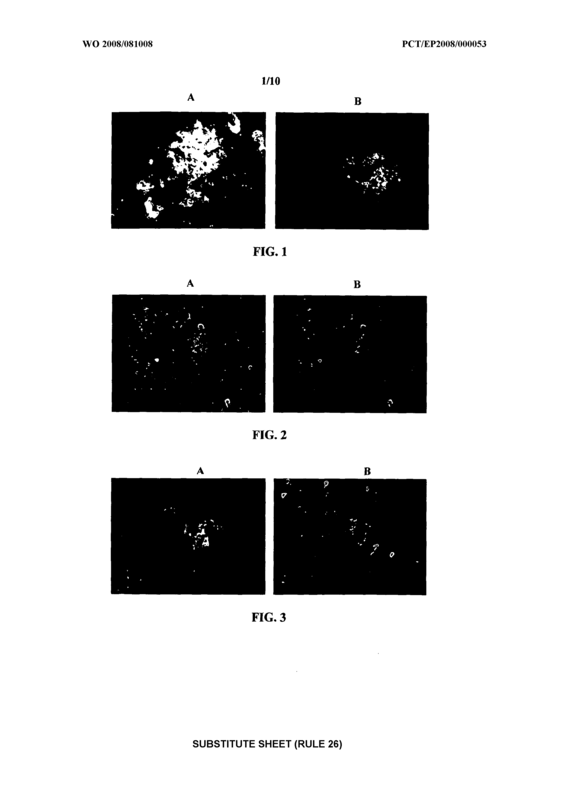 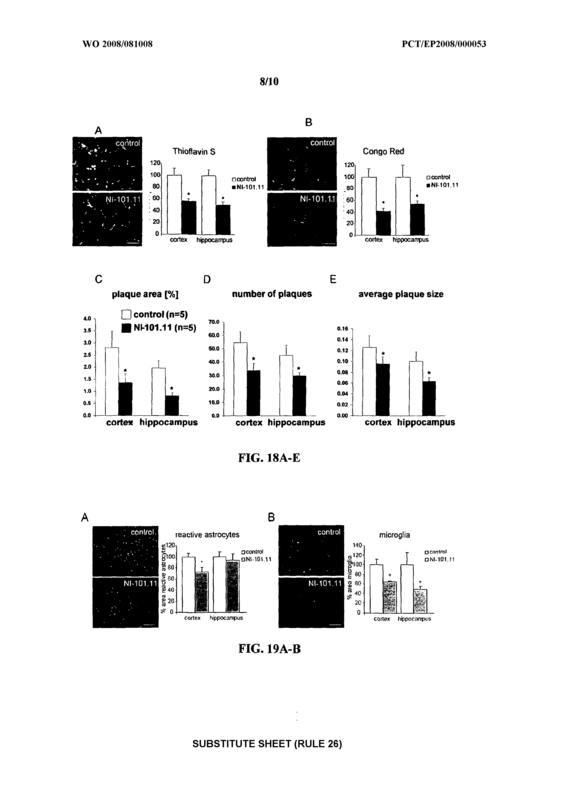 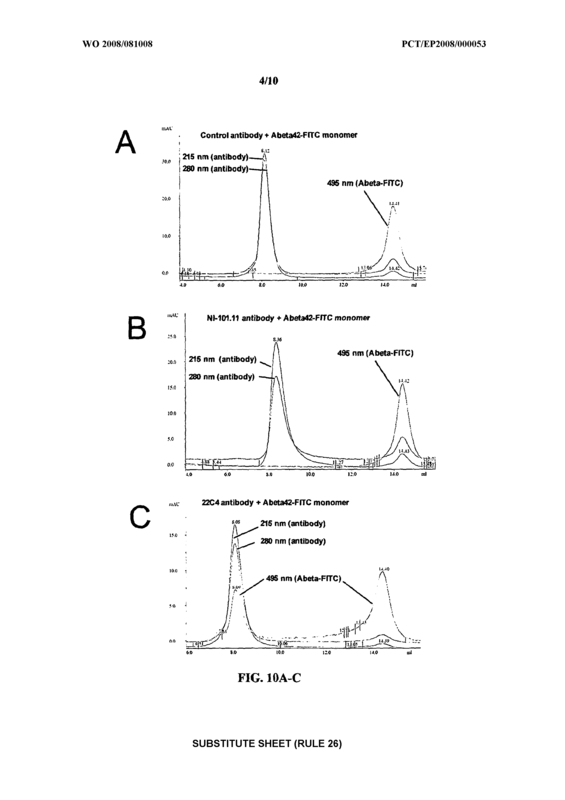 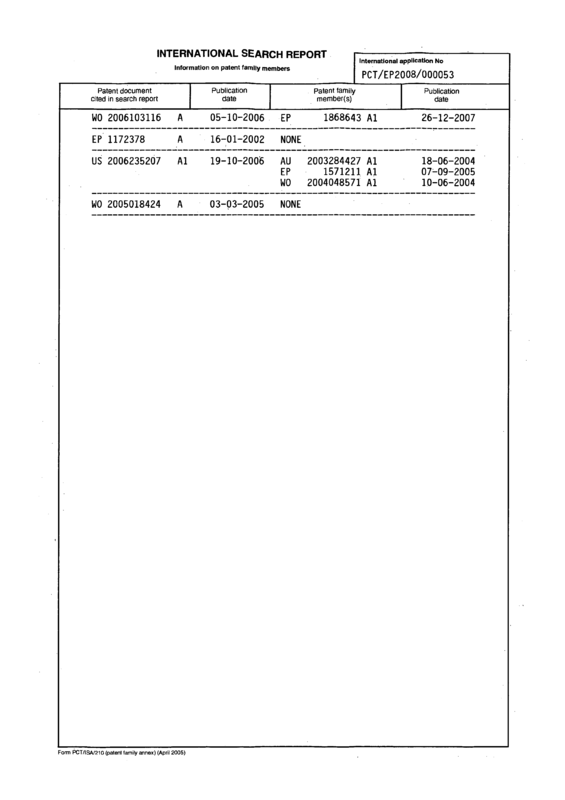 An isolated antibody or antigen-binding fragment thereof, wherein the antibody competitively inhibits a reference antibody selected from the group consisting of NI-101.10, NI-101.11, NI-101.12, NI-101.13, NI-101.12F6A, NI-101.13A, and NI-101.13B from binding to the neoepitope of a disorder-associated. 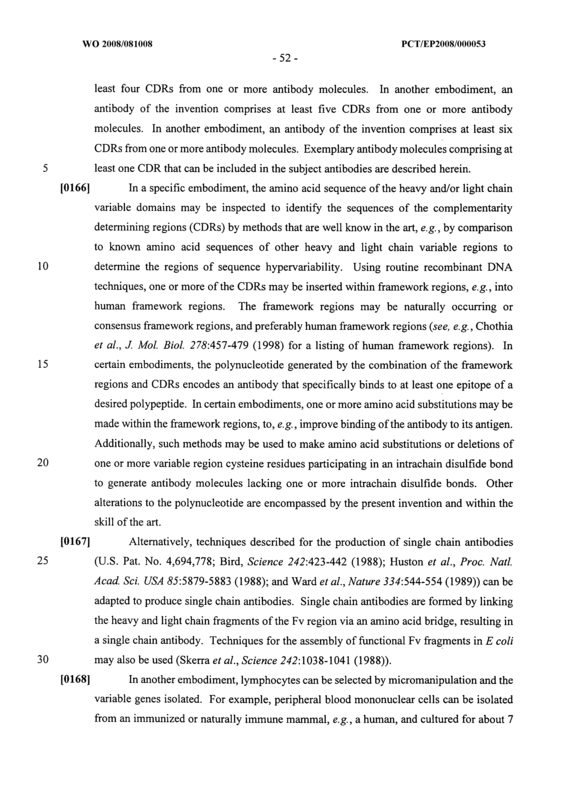 An isolated antibody or antigen-binding fragment thereof wherein the antibody comprises an antigen binding domain identical to that of an antibody selected from the group consisting of NI-101.10, NI-101.11, NI-101.12, NI-101.13, NI-101.12F6A, NI-101.13A, and NI-101.13B.